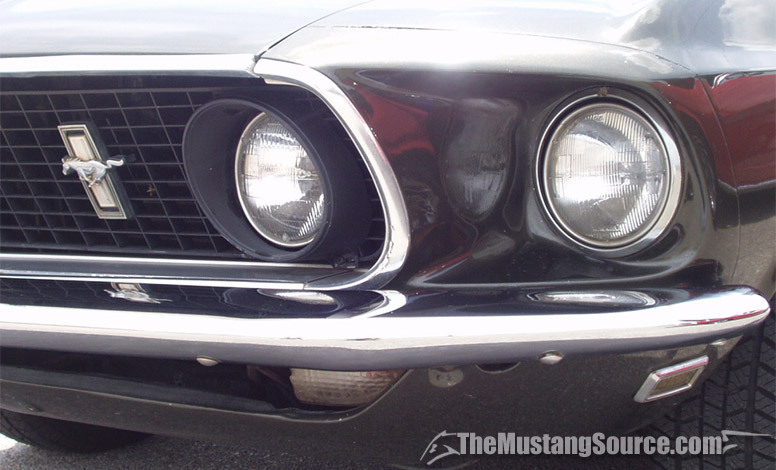 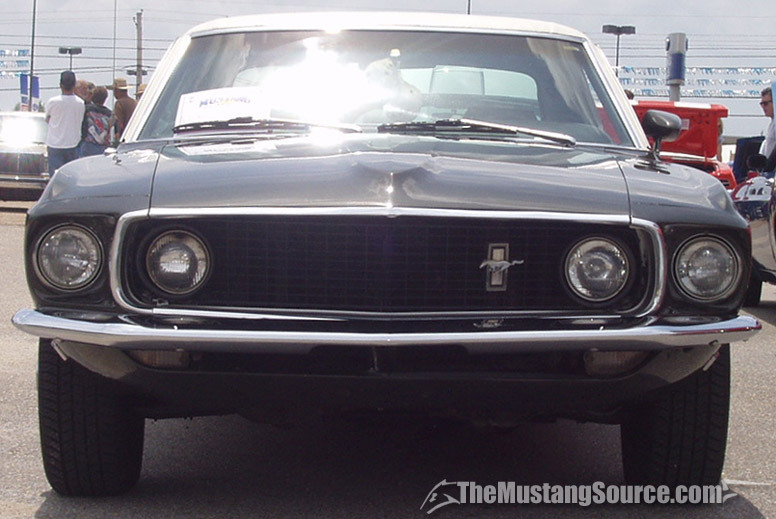 Dual headlamps were introduced in 1969, with the extra pair set into the outer area of the grille. 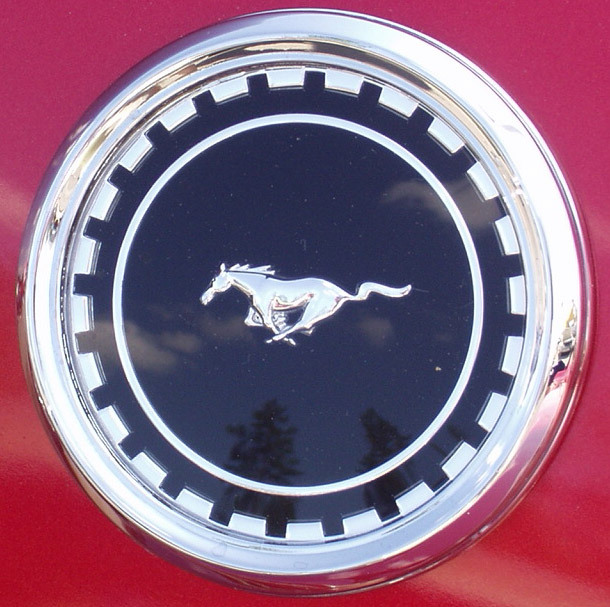 The corralled grille pony was replaced with the pony and tribars logo, set off-center to the drivers side. 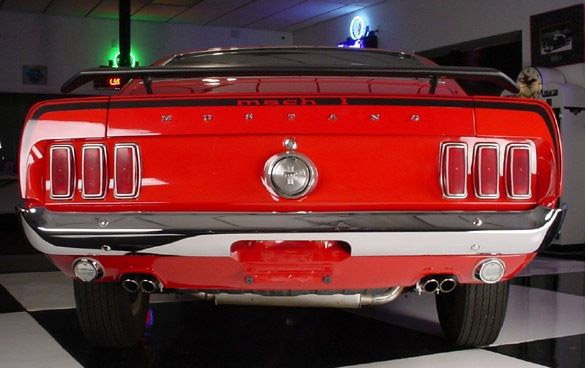 The wheelbase remained 108 inches, but the overall length increased by almost 4 inches, and the width increased by almost half an inch. 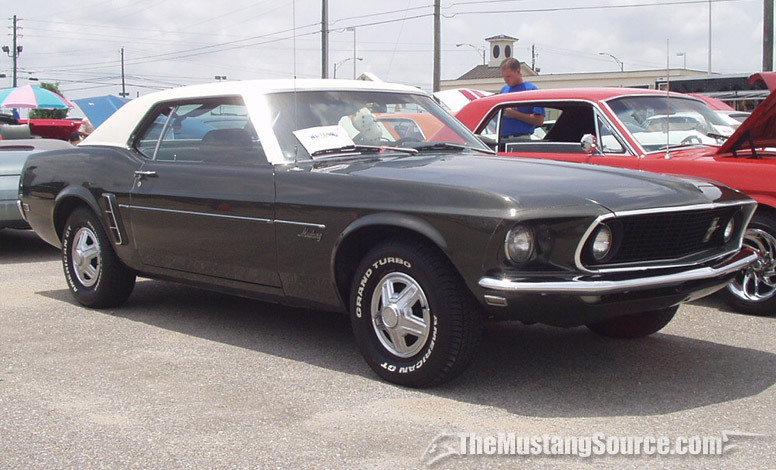 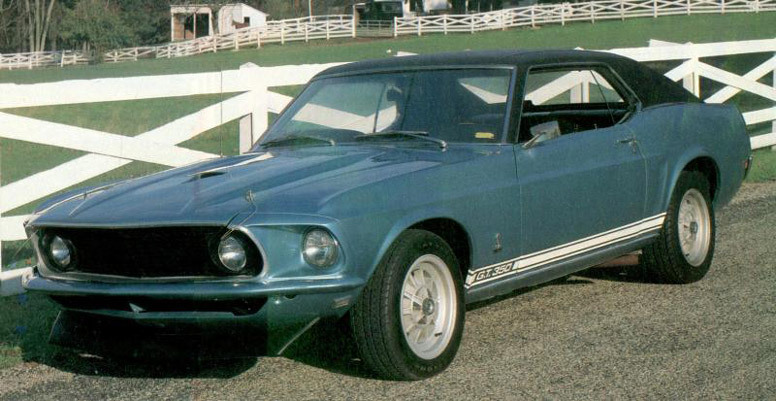 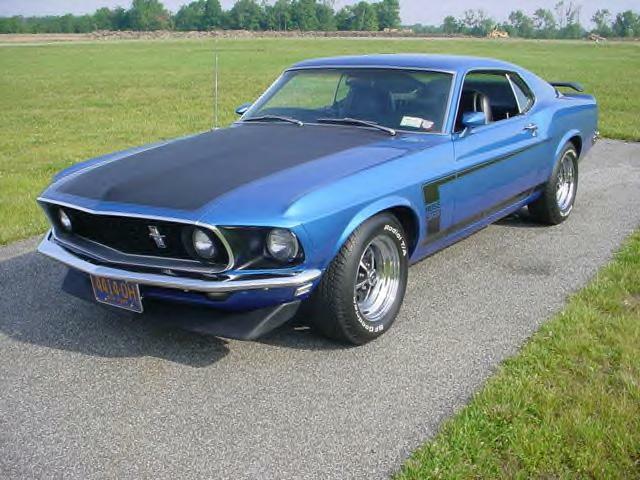 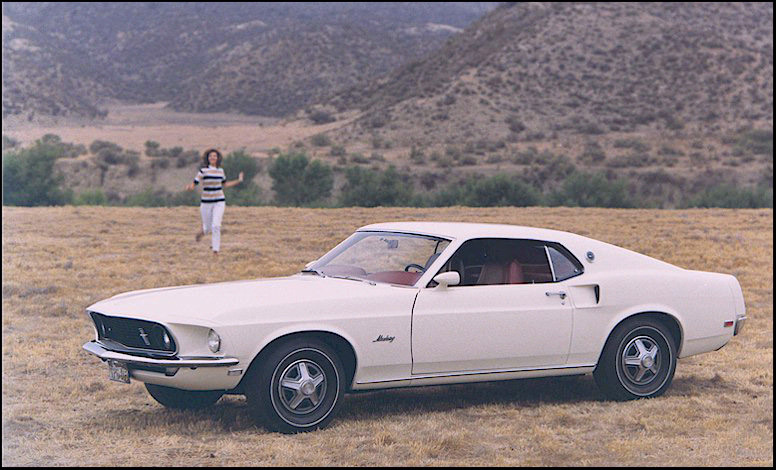 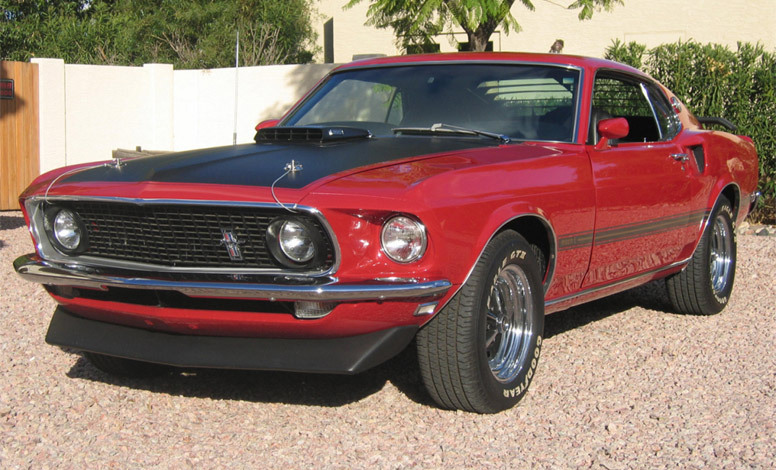 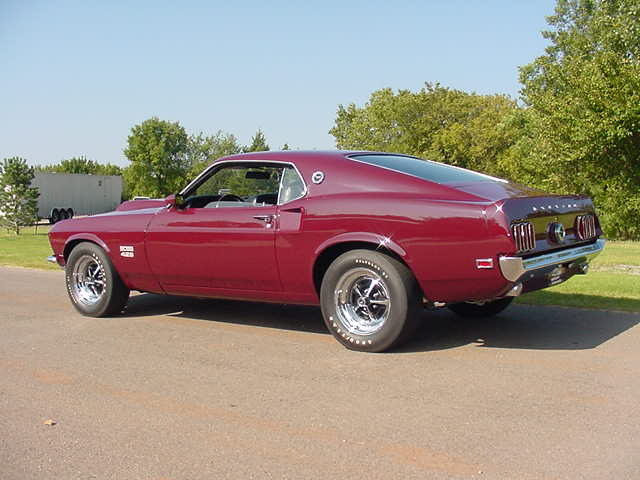 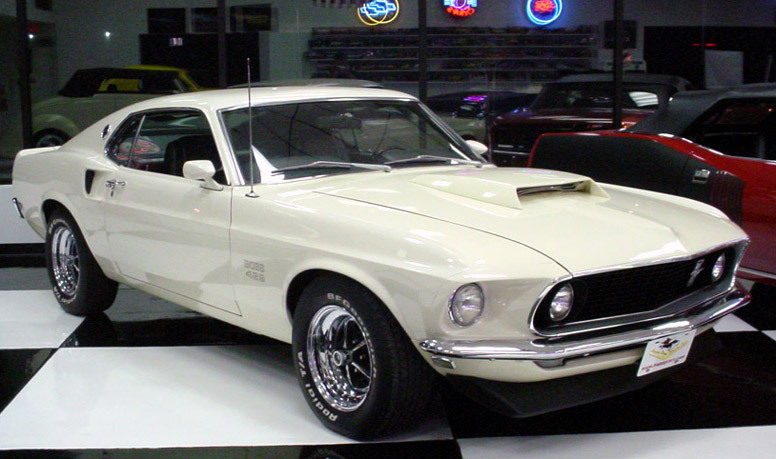 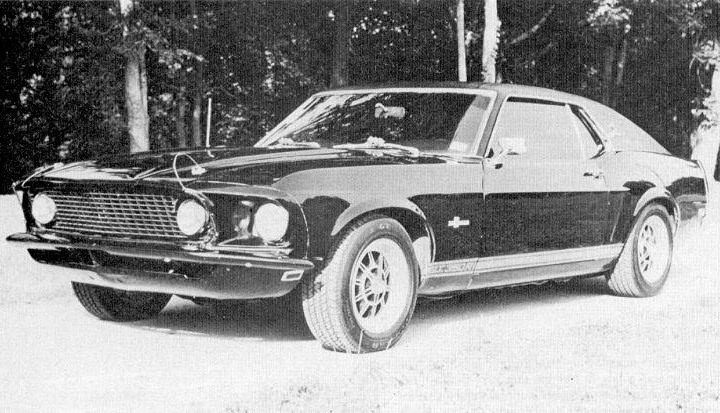 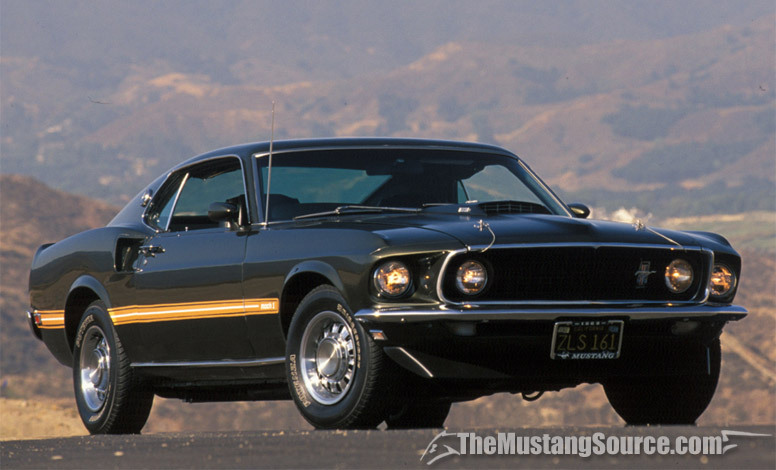 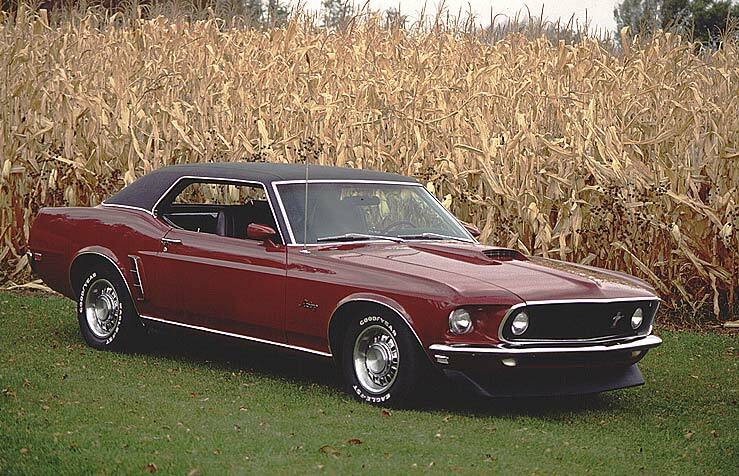 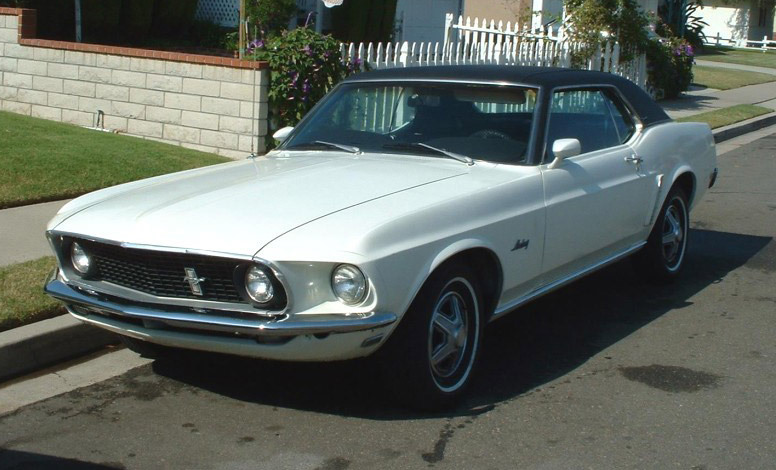 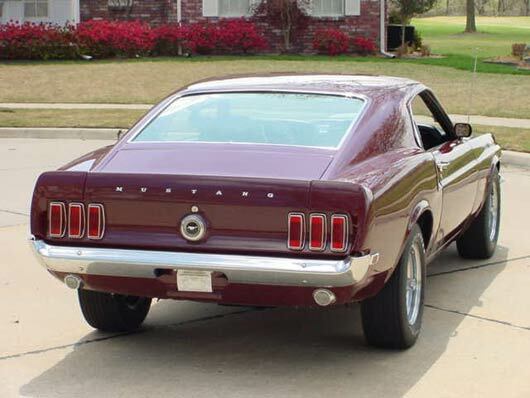 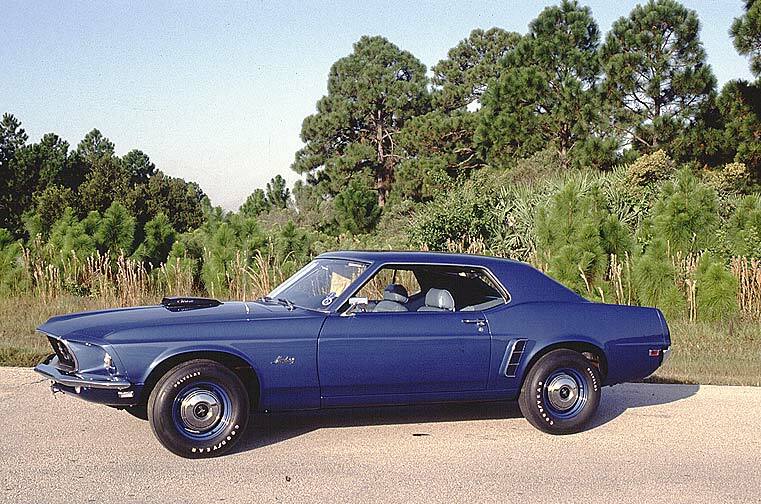 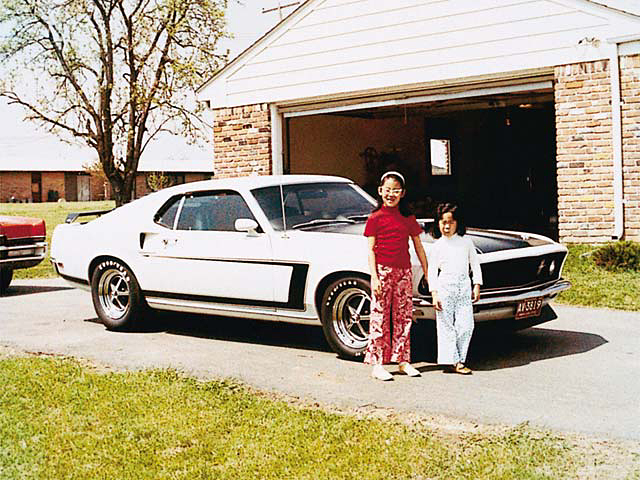 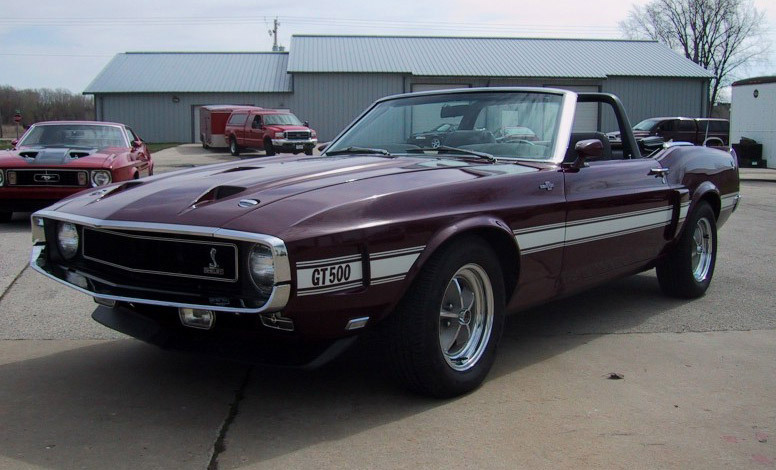 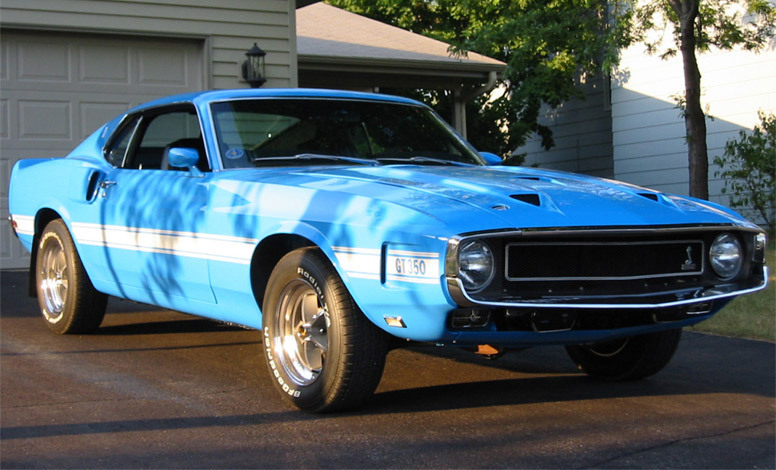 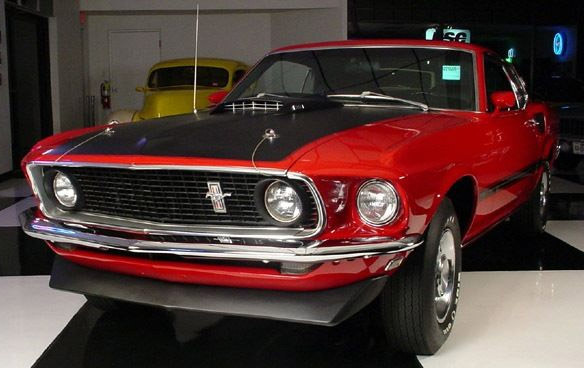 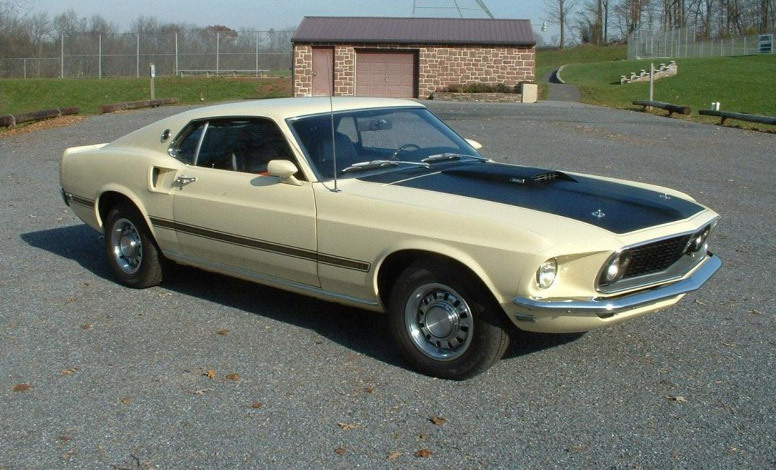 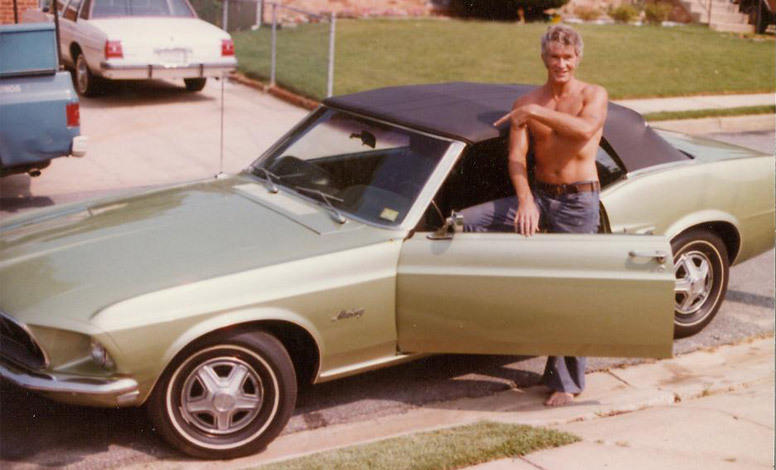 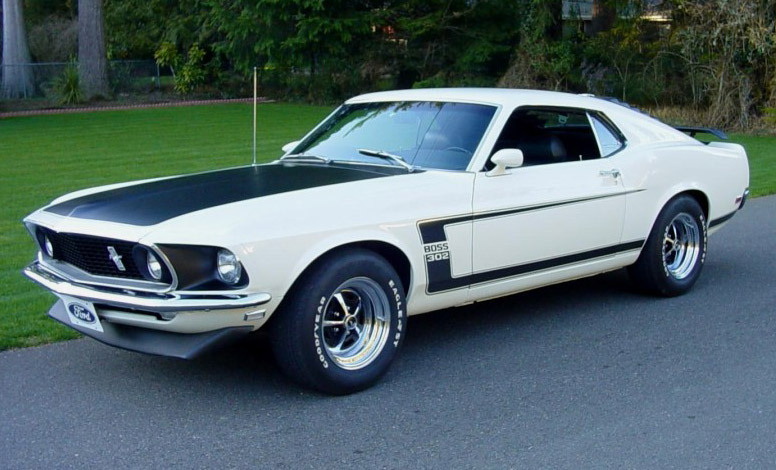 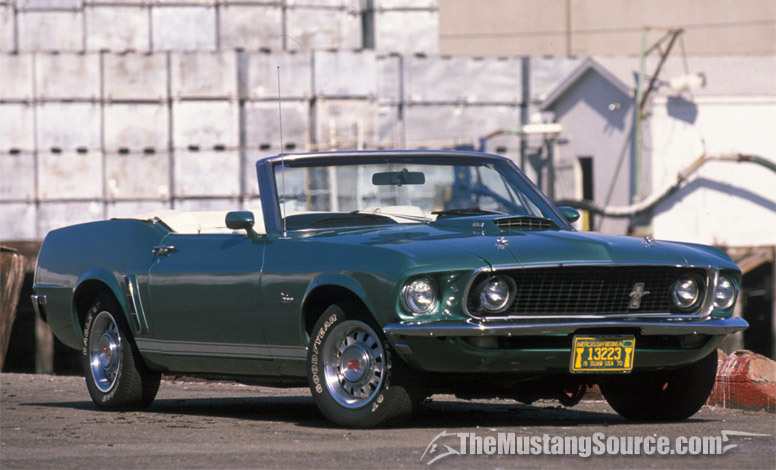 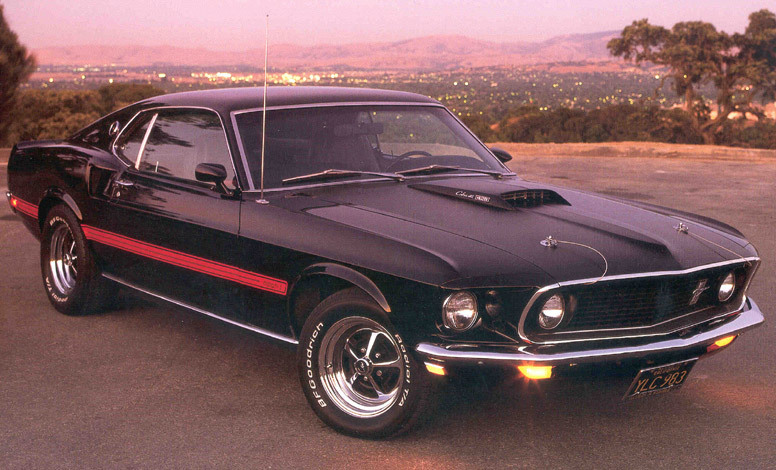 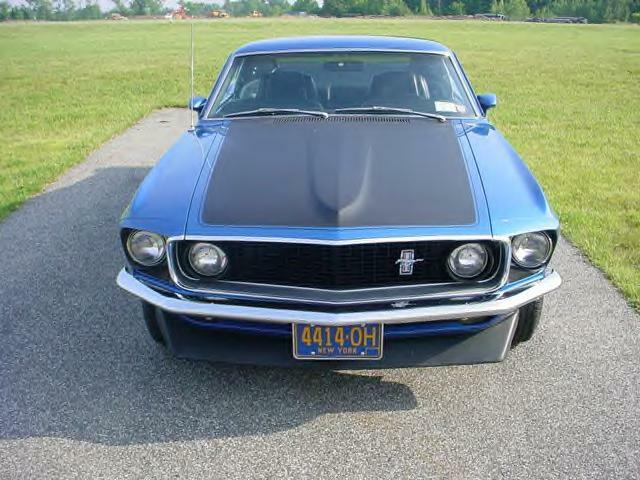 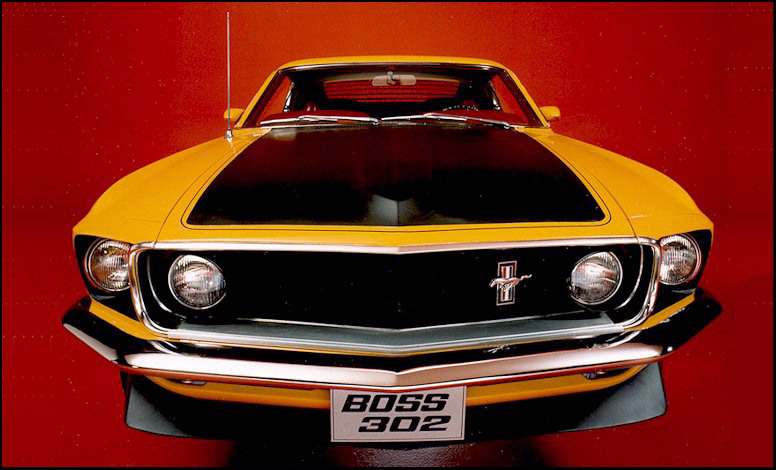 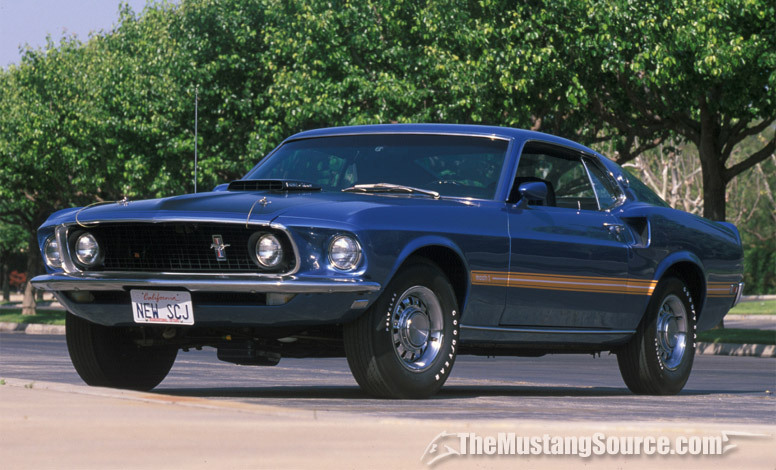 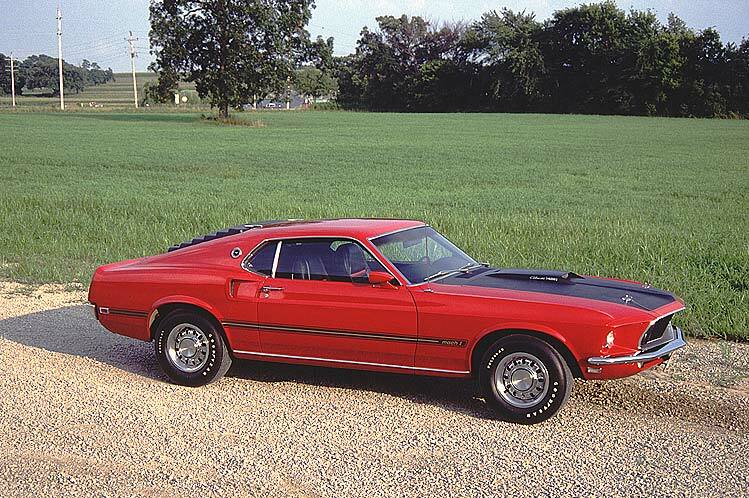 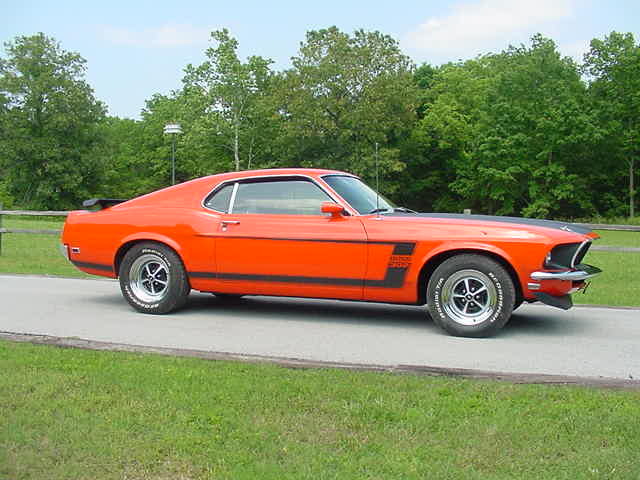 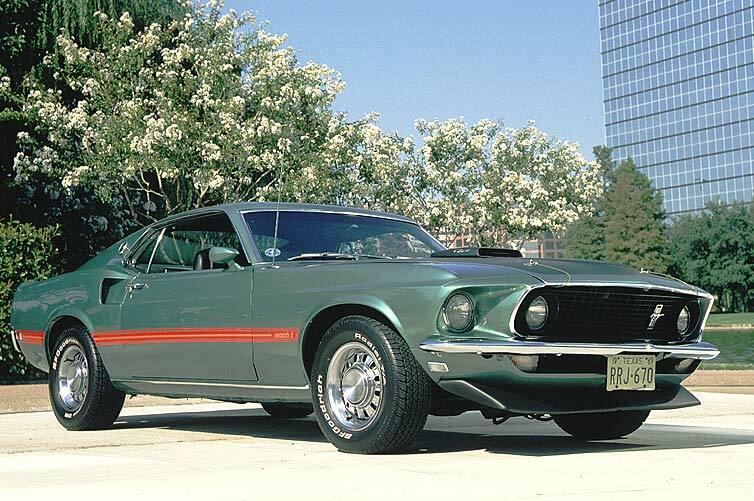 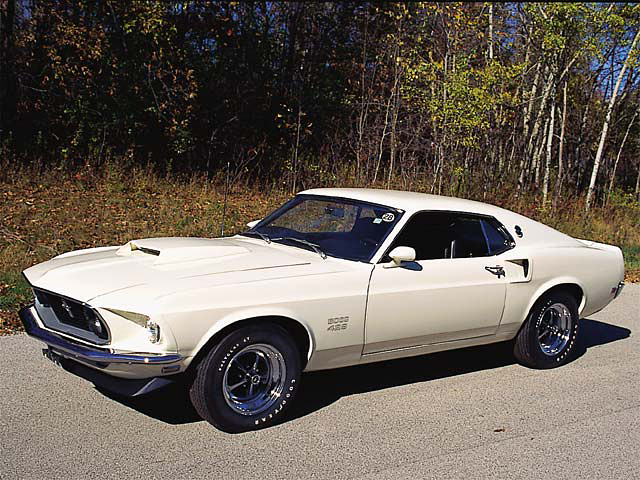 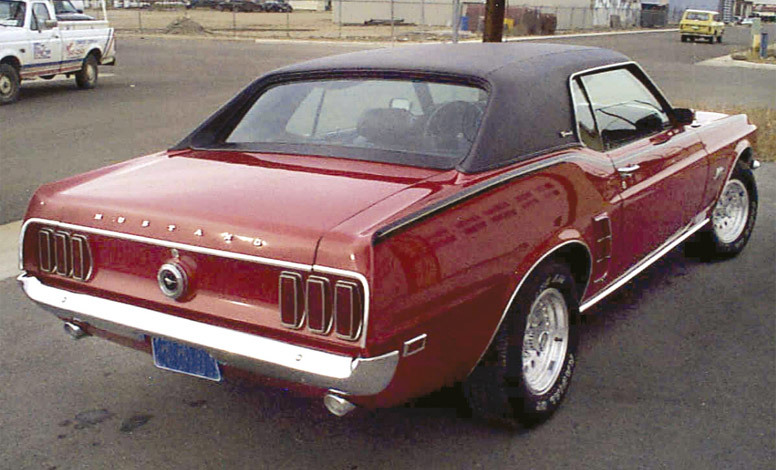 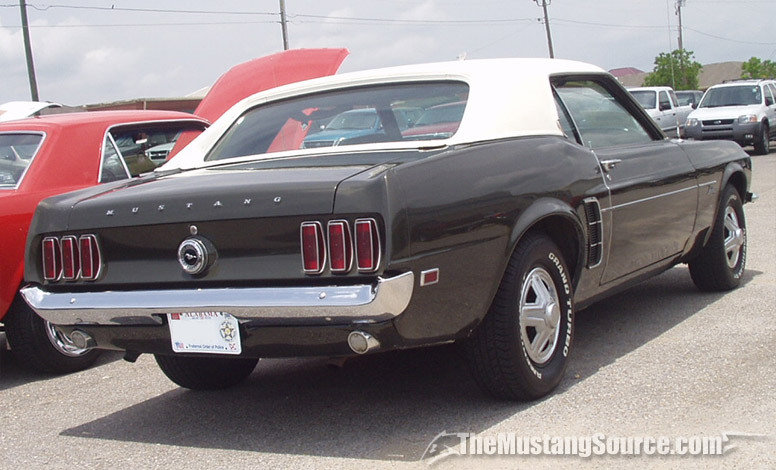 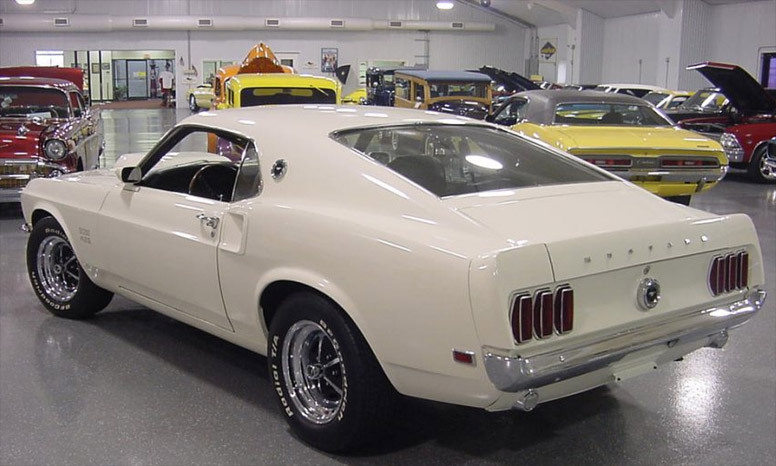 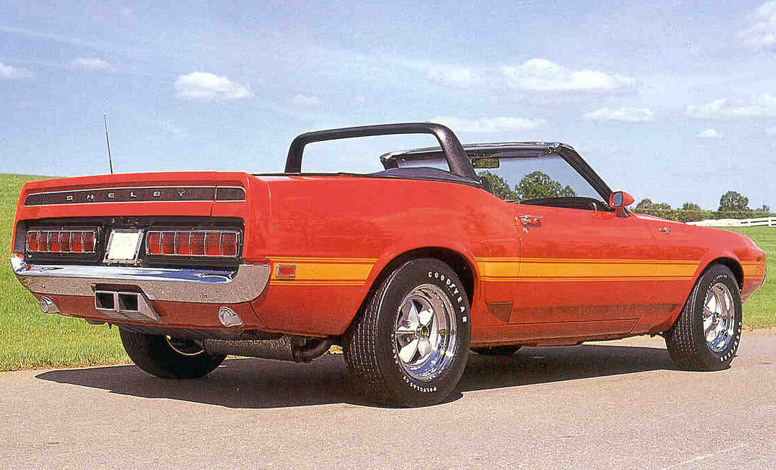 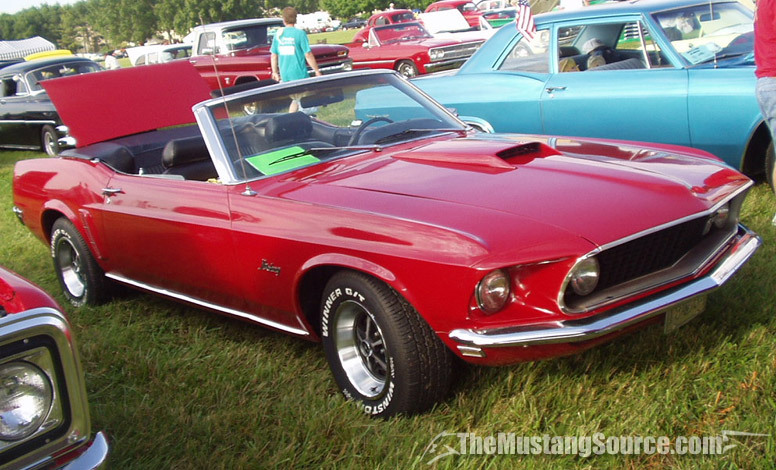 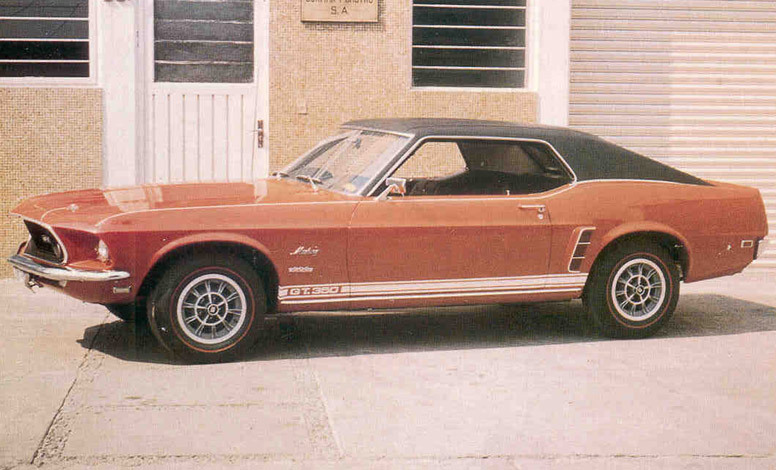 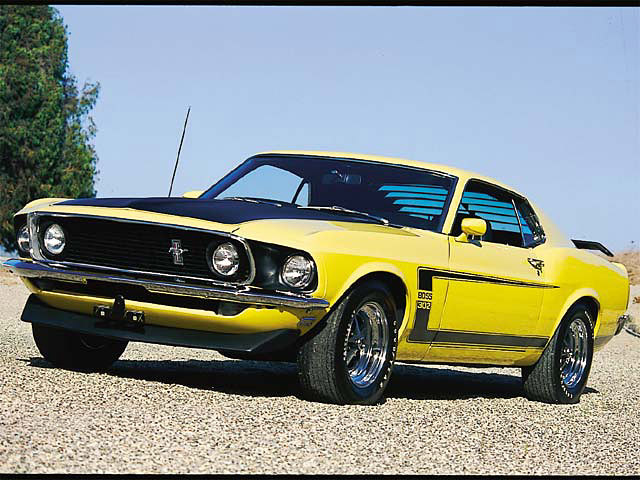 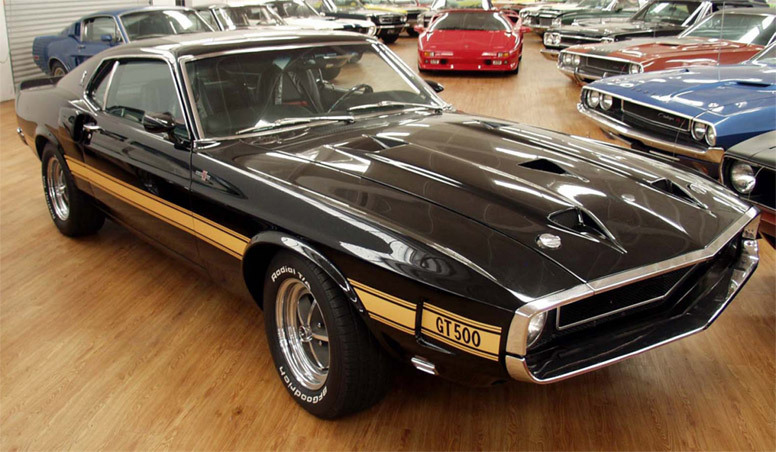 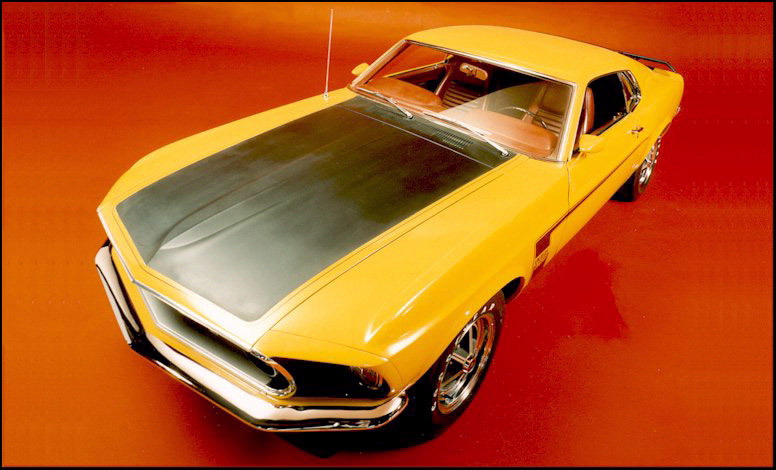 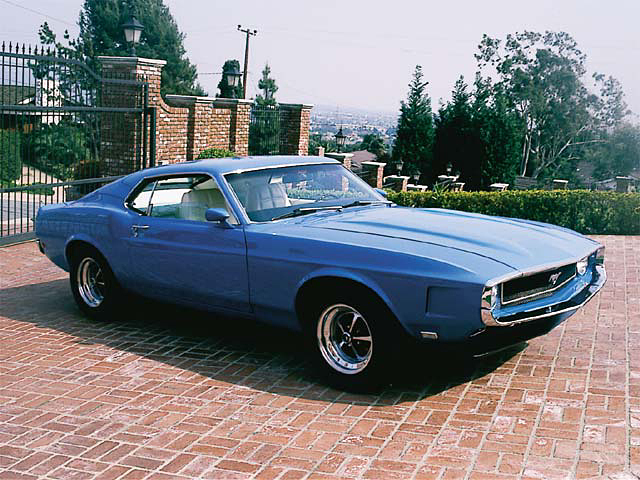 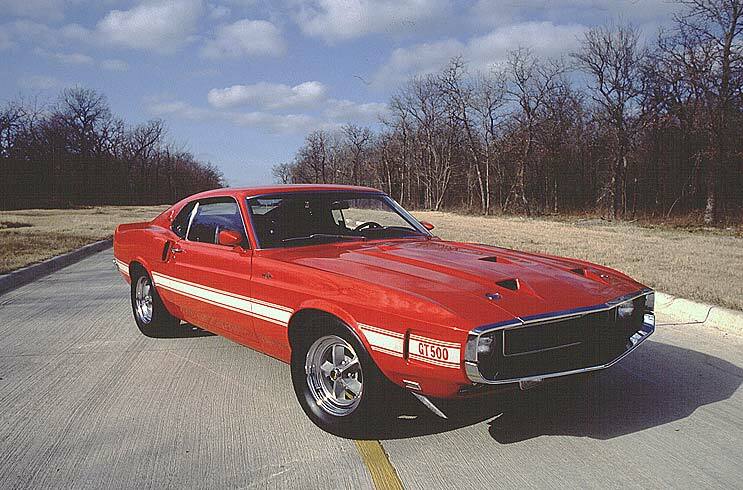 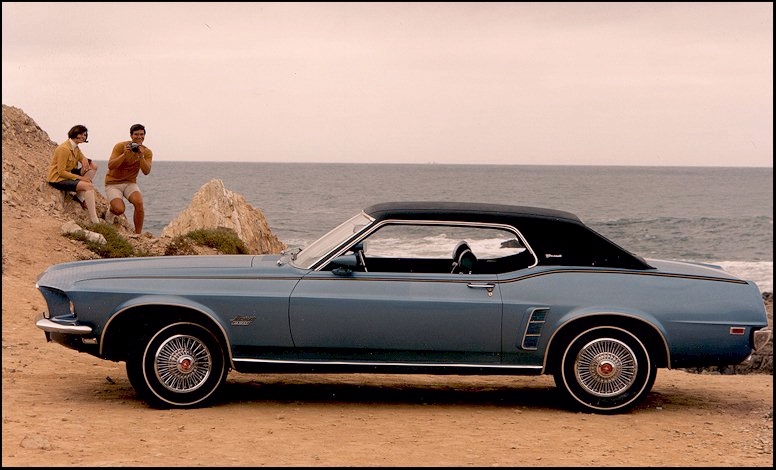 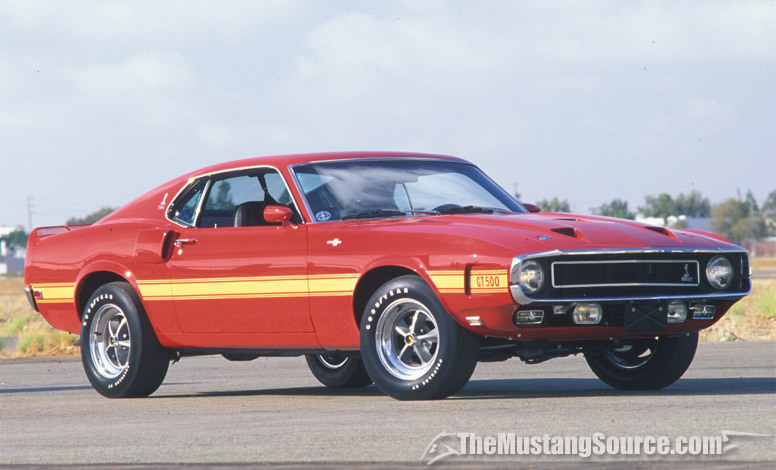 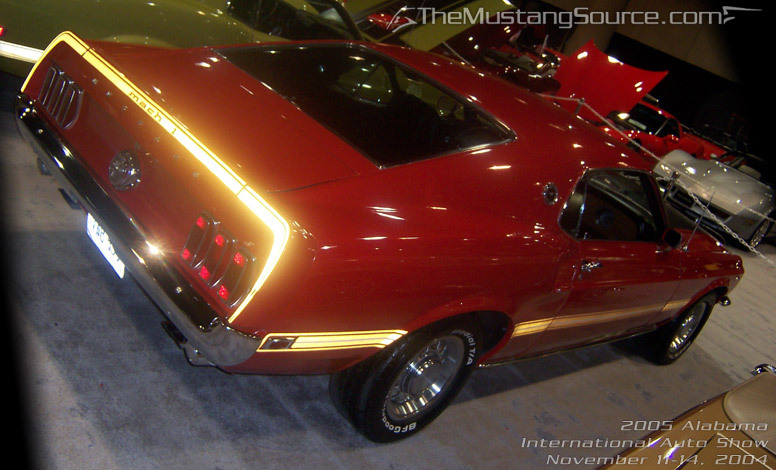 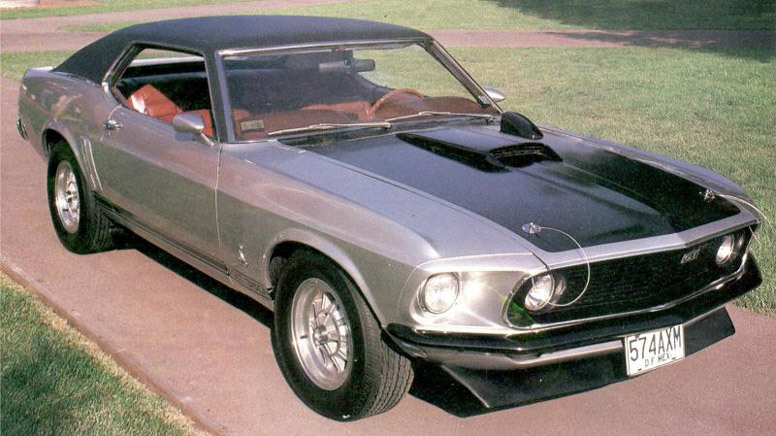 Coupes, fastbacks, and convertibles were still offered, but new models joined the lineup: Mach 1, Boss, and Grand�. 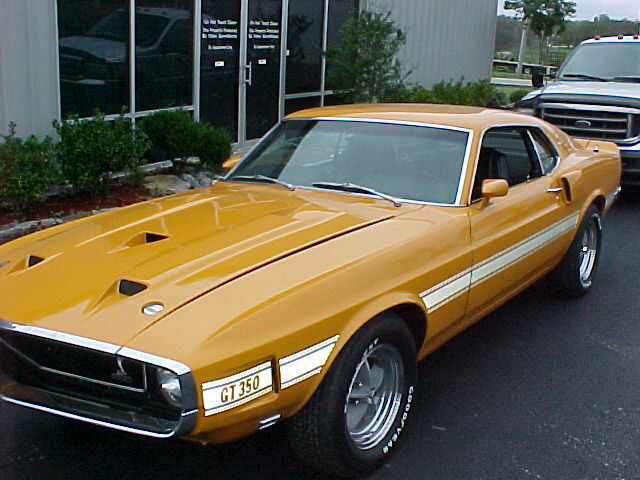 All of these models took their toll on GT sales; they were continued in 1970, but the GT was not. 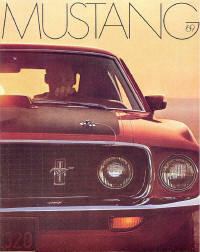 Click here to download the salesroom brochure pictured at left. 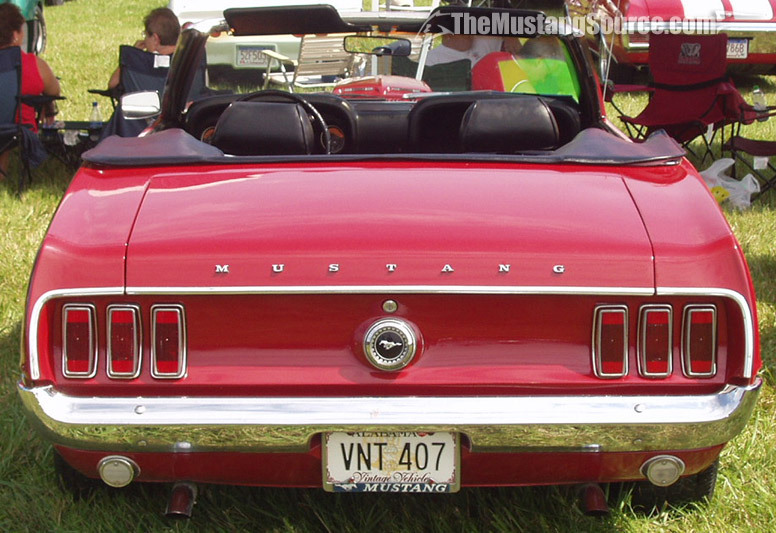 Only about 50 Mustang Es were produced. 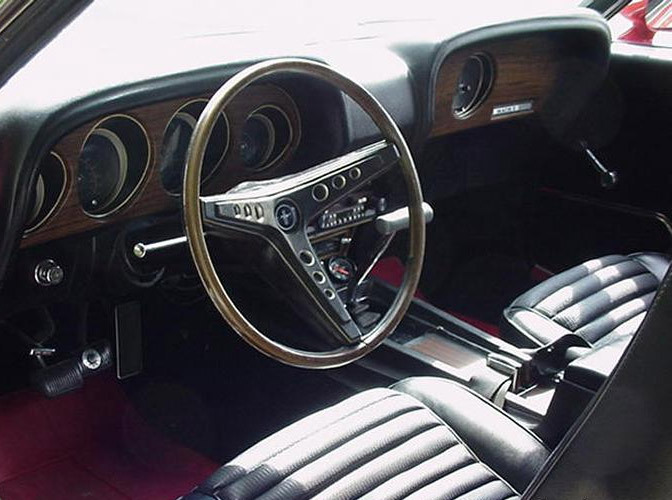 They were economy cars with a 250ci six cylinder engine, automatic transmission with a special torque converter, and a low 2.33:1 rear axle ratio. 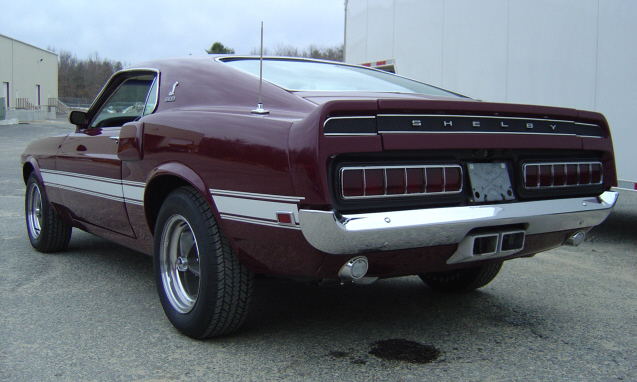 They were all sportsroofs, and had Mustang 'E' lettering on the rear quarters. 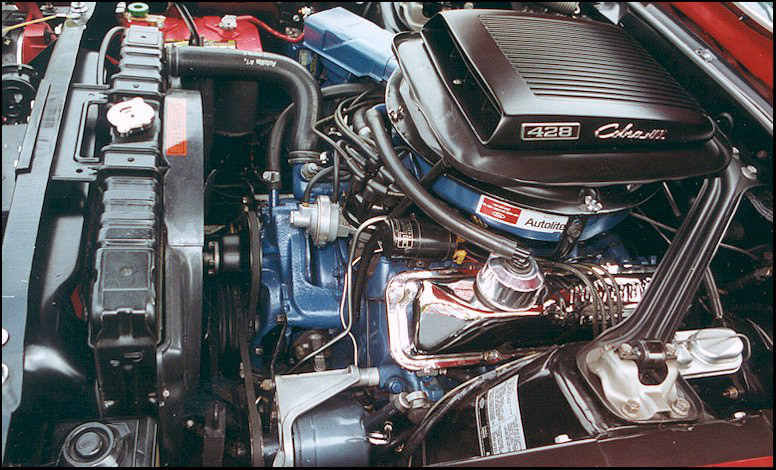 The 351cid V-8 was introduced in 1969, and was available with 250 or 290 hp. 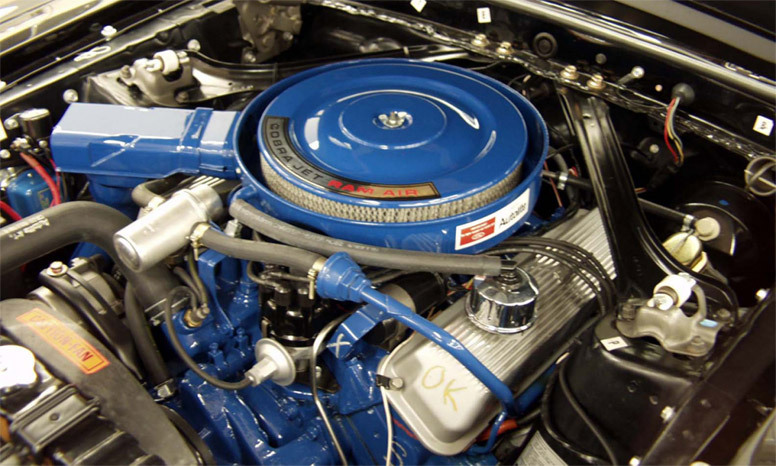 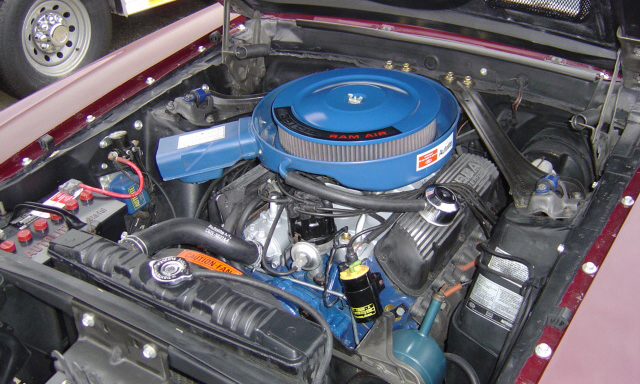 For those wanting more power, the 335-hp 428cid Cobra Jet V-8 big block was available with or without Ram-Air. 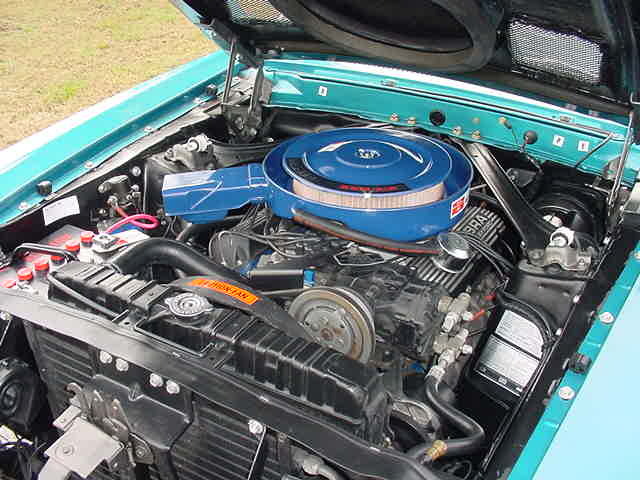 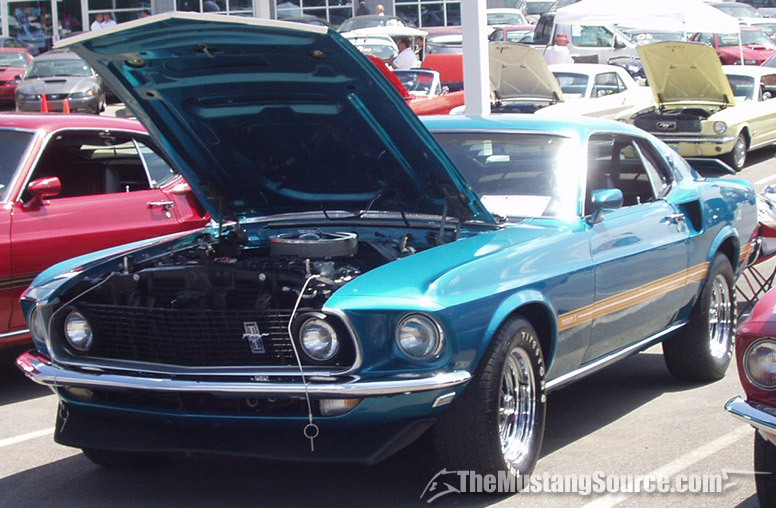 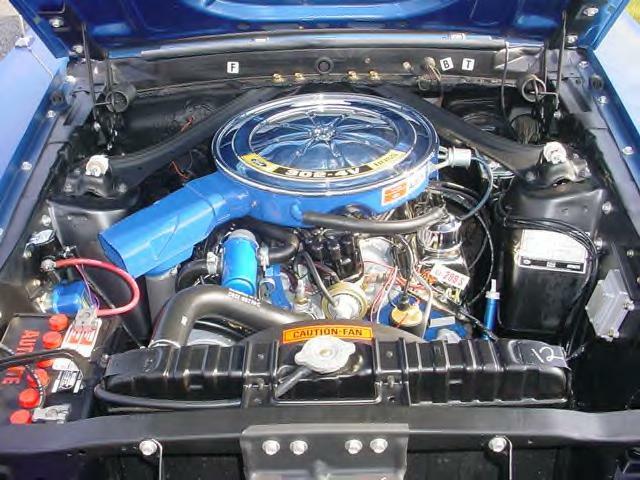 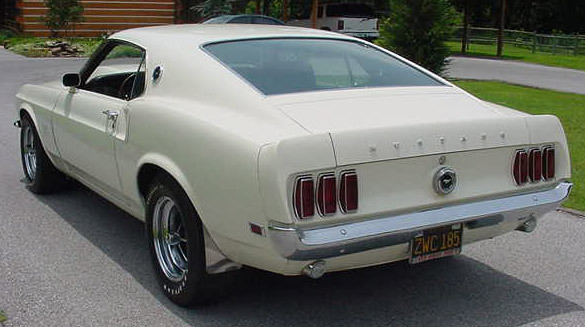 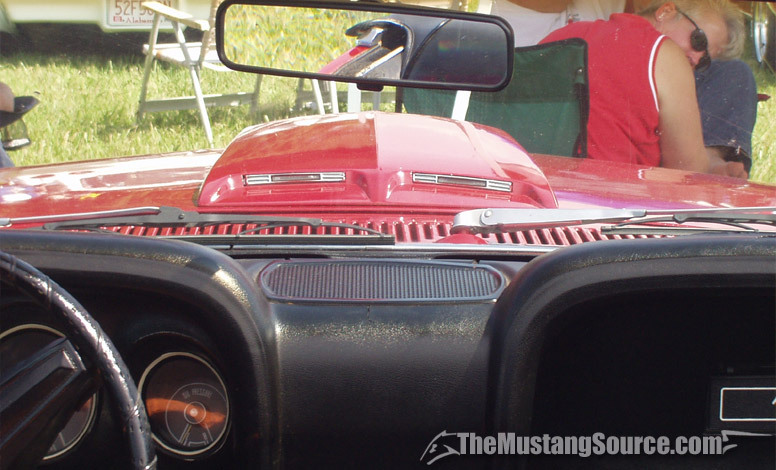 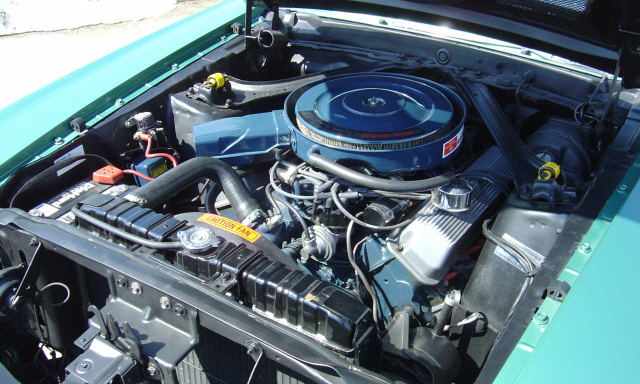 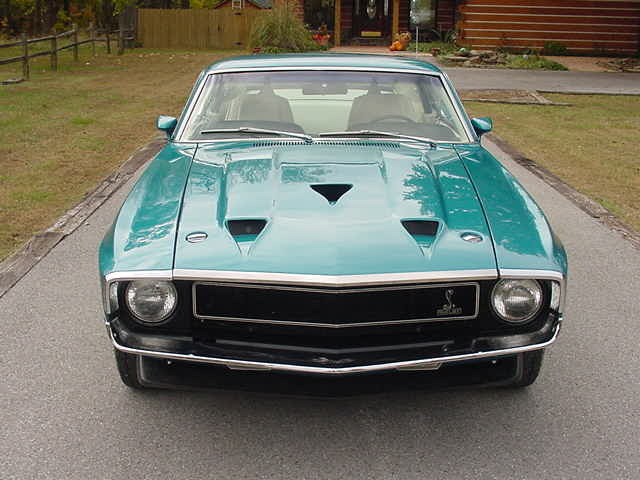 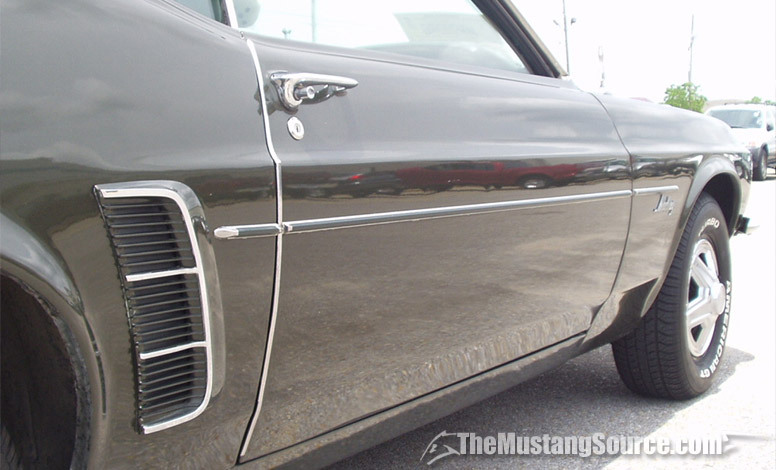 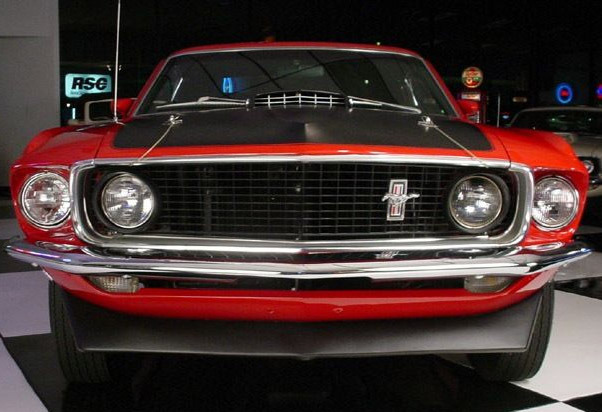 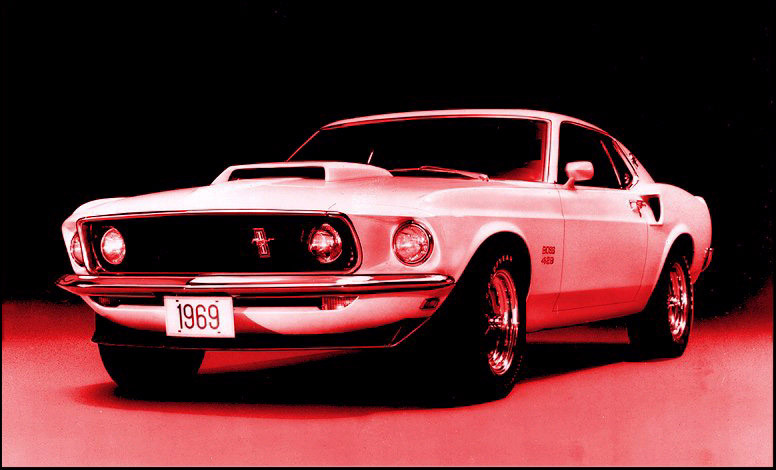 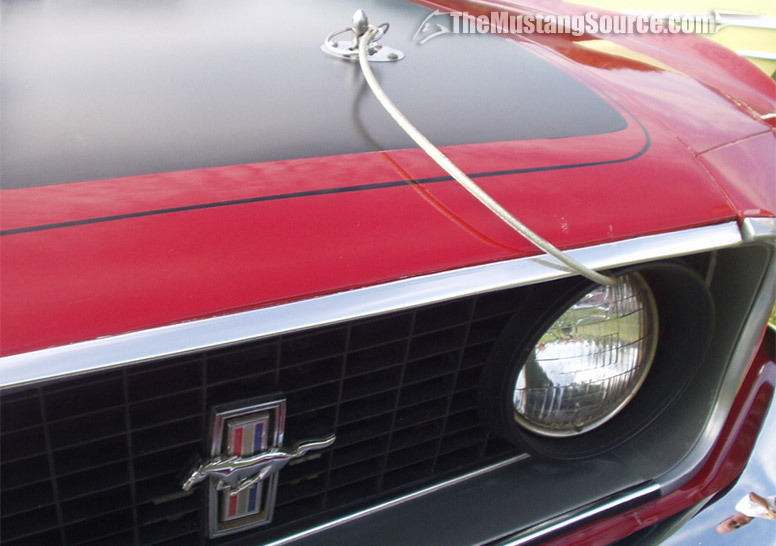 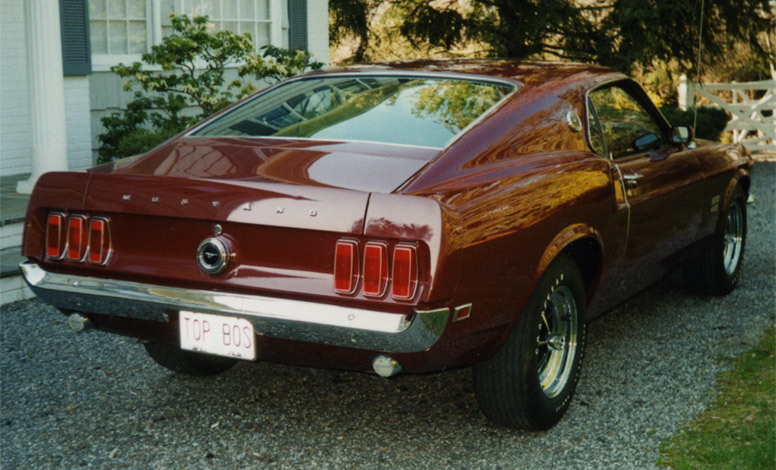 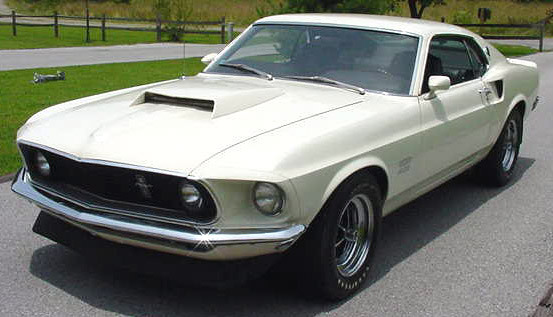 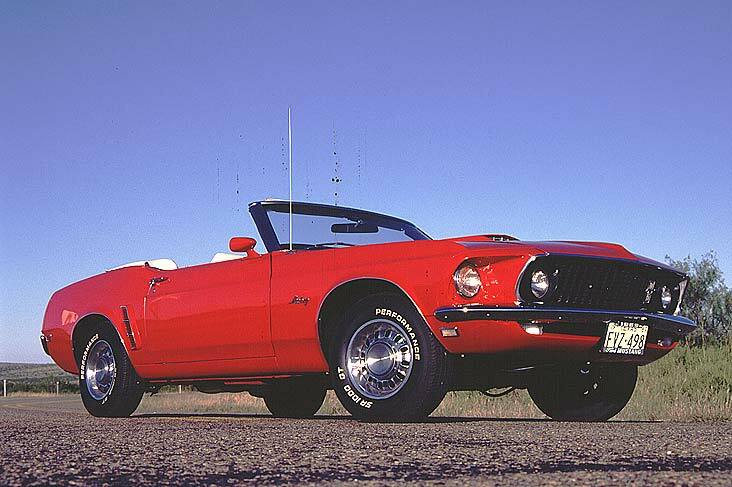 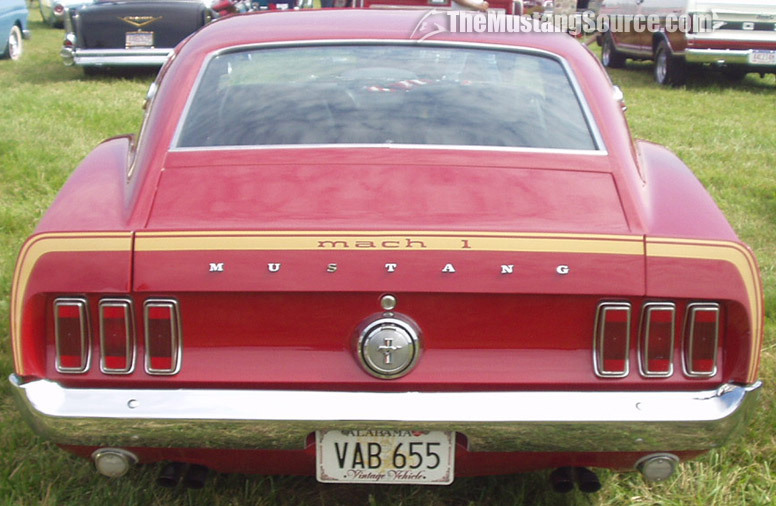 More than 80 percent of Mustangs in 1969 had V-8 engines. 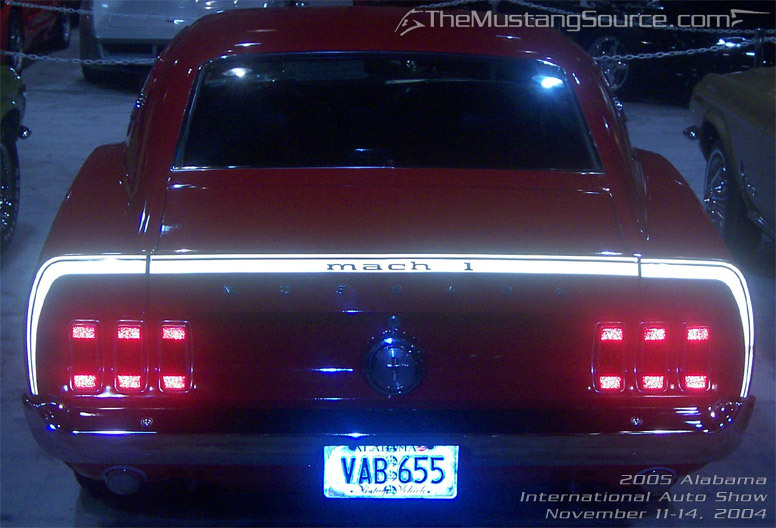 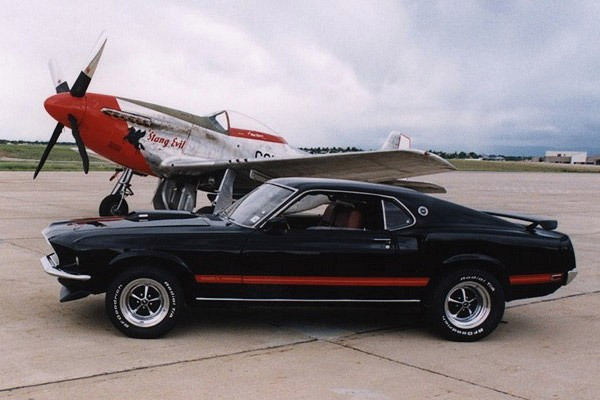 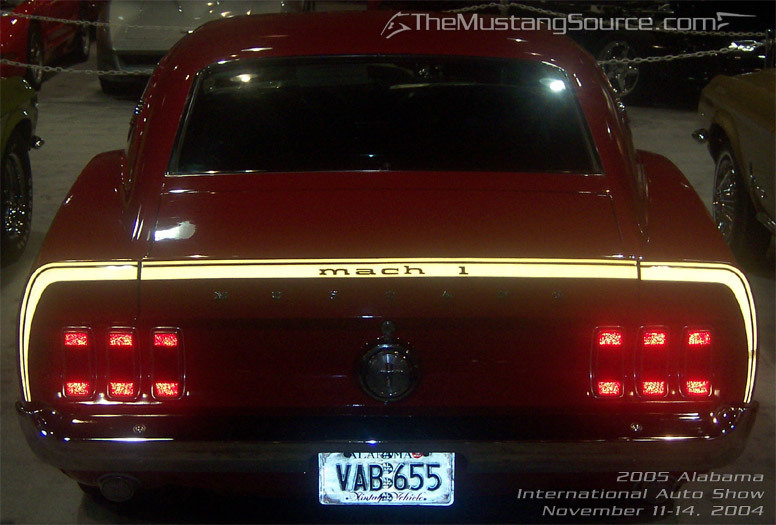 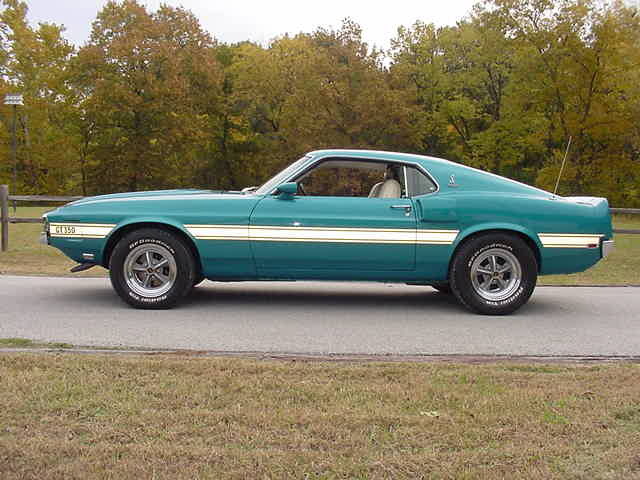 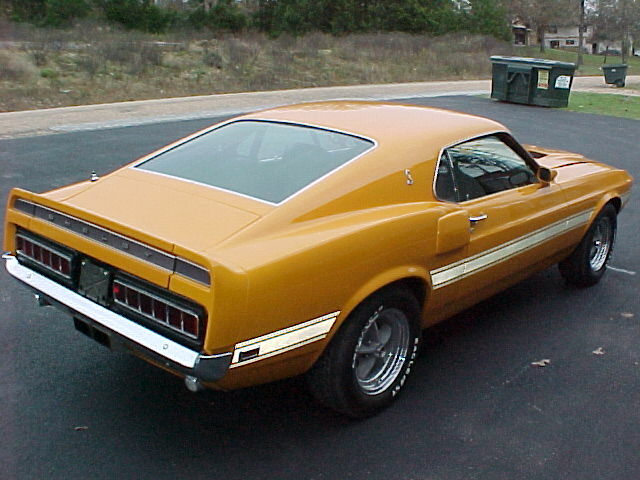 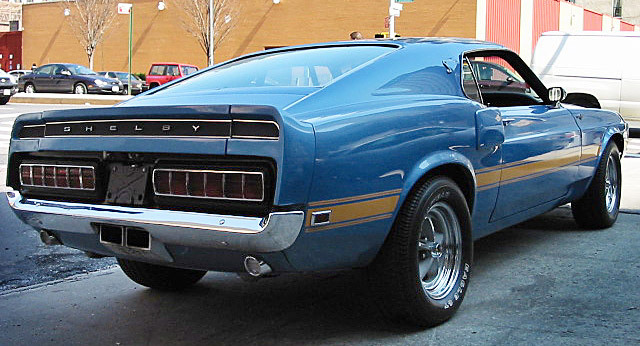 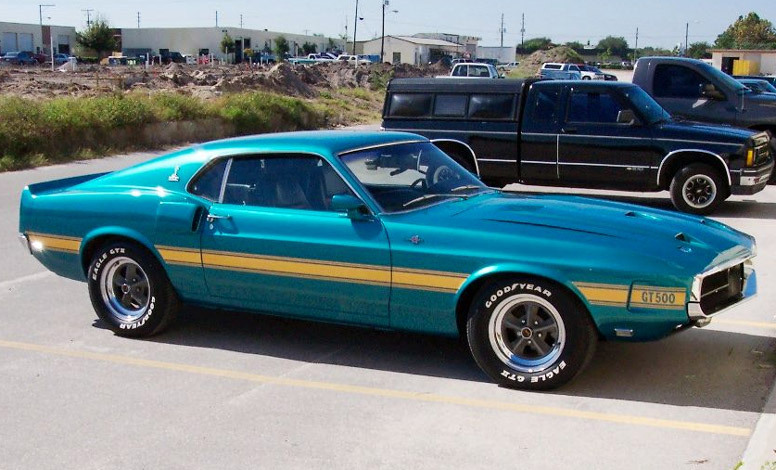 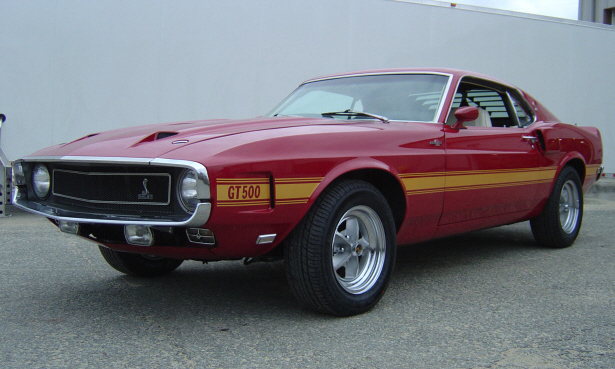 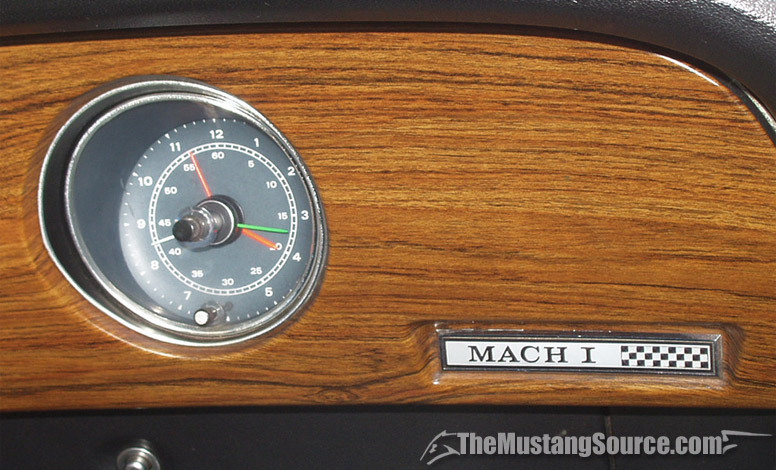 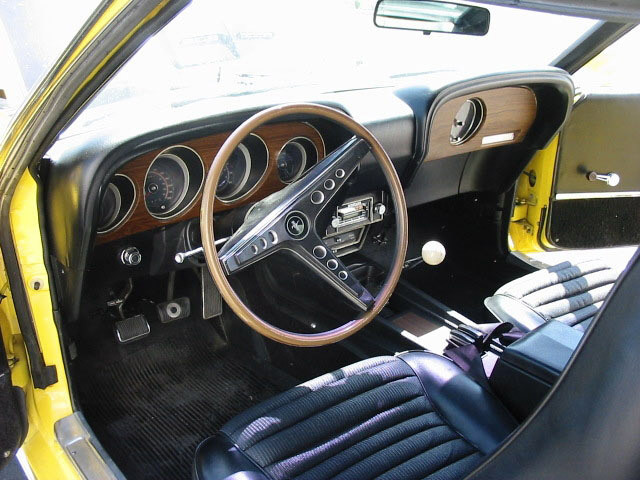 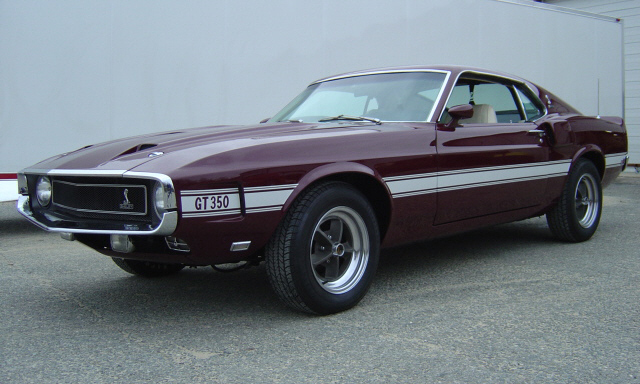 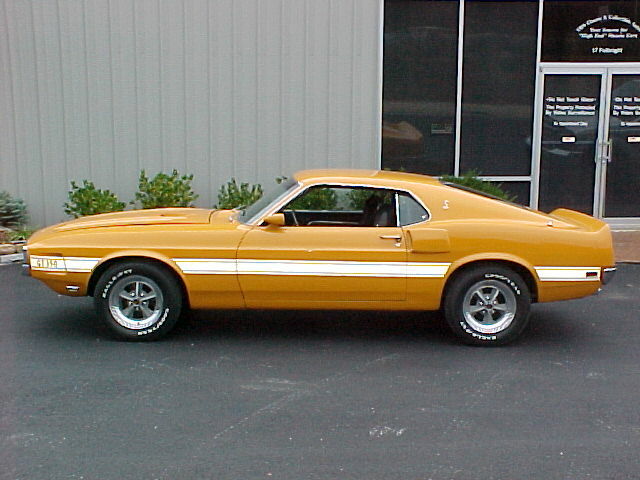 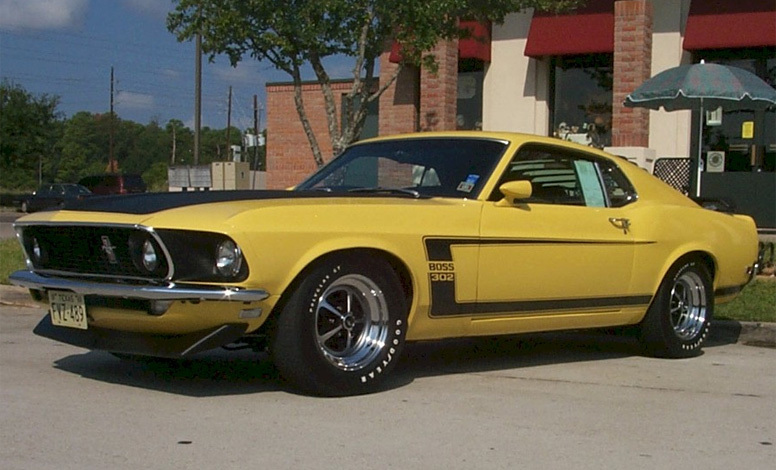 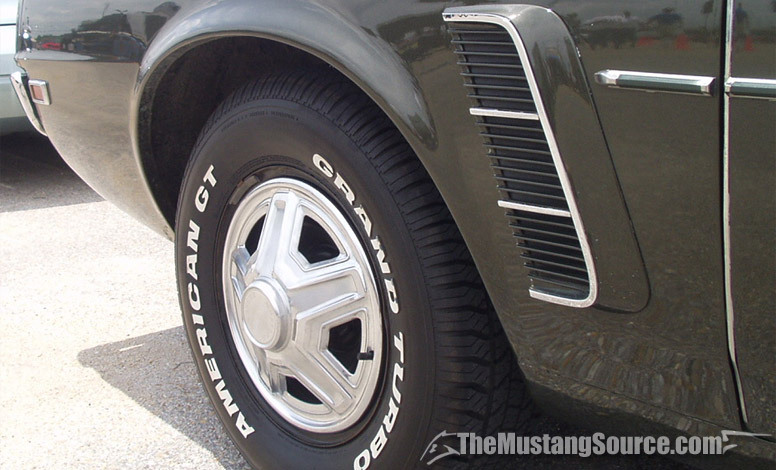 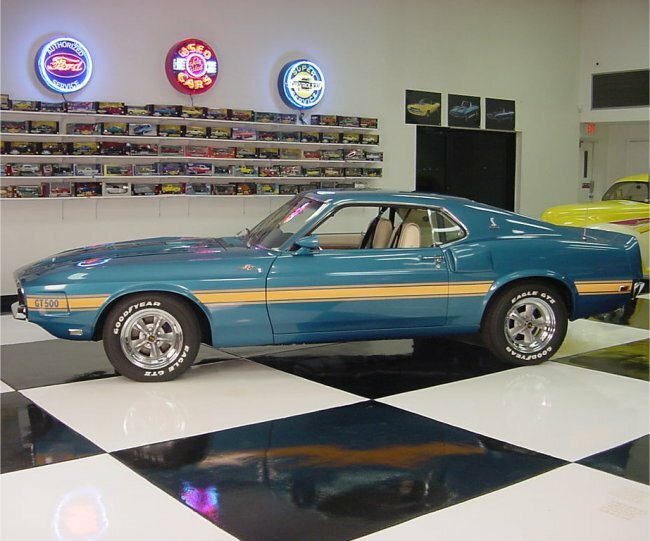 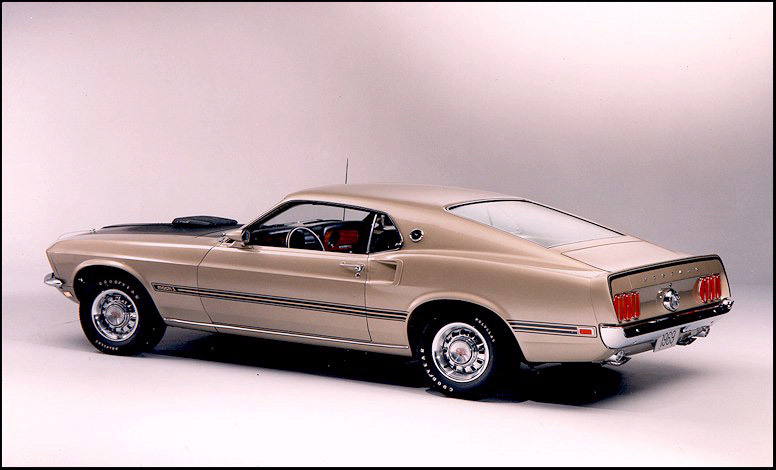 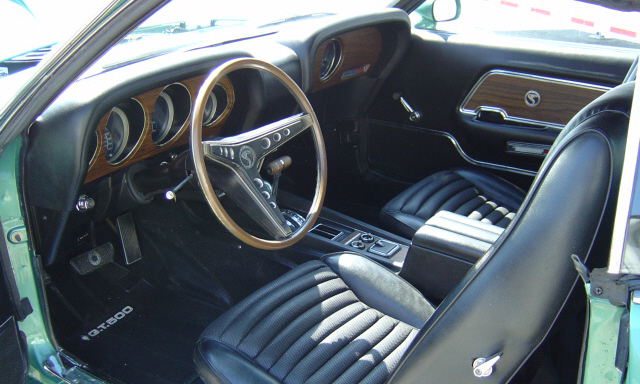 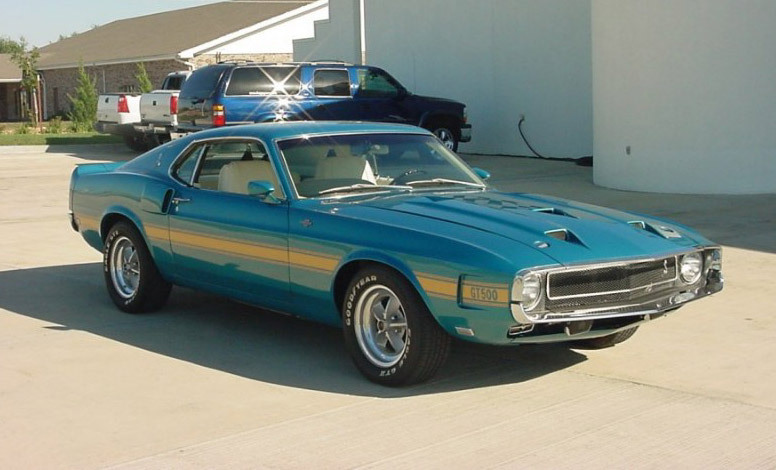 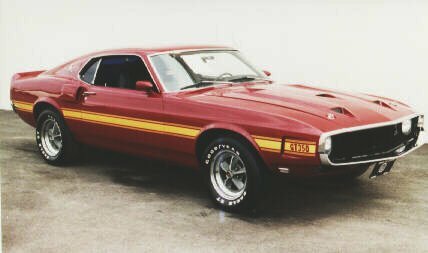 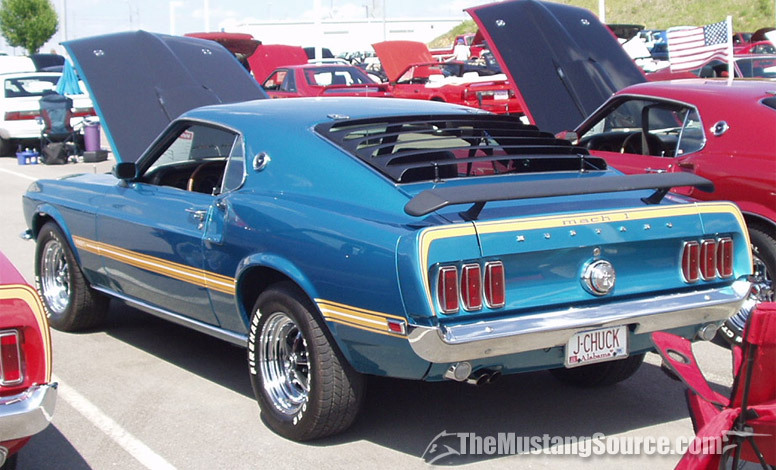 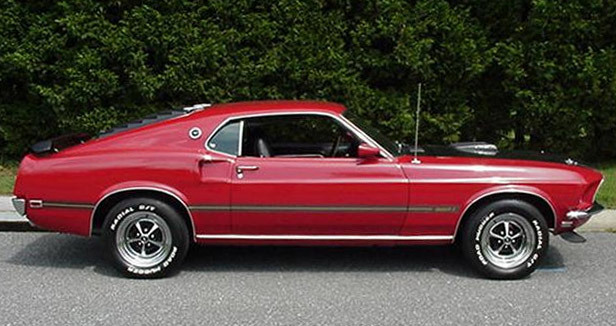 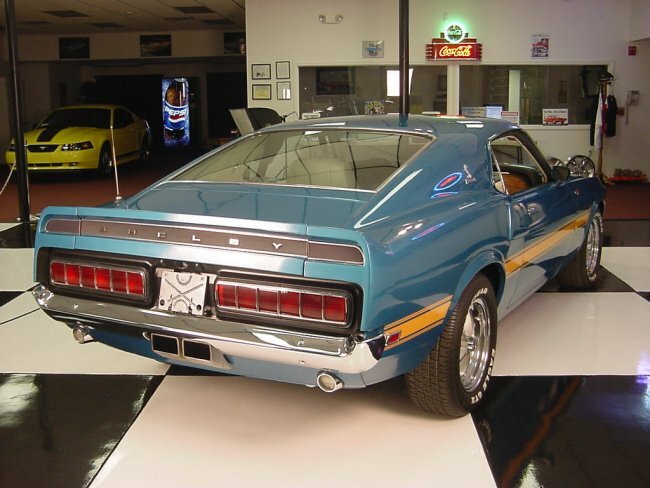 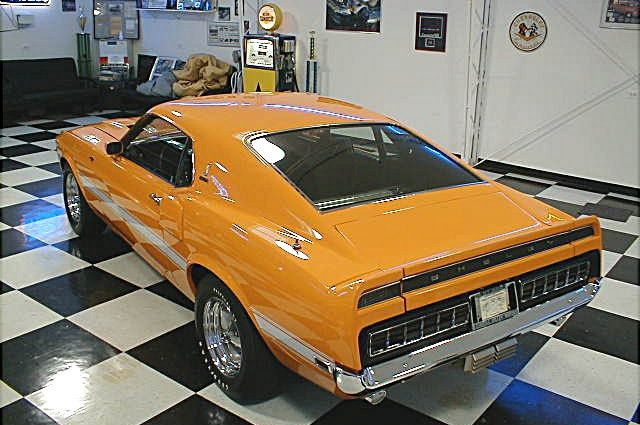 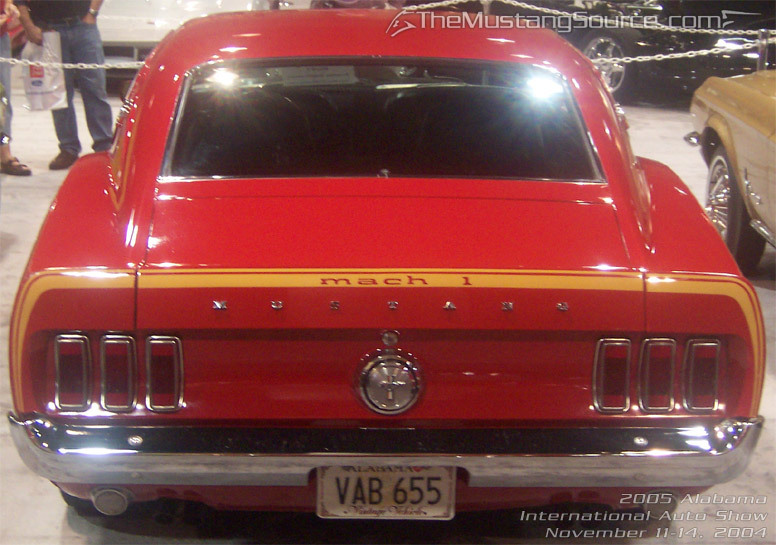 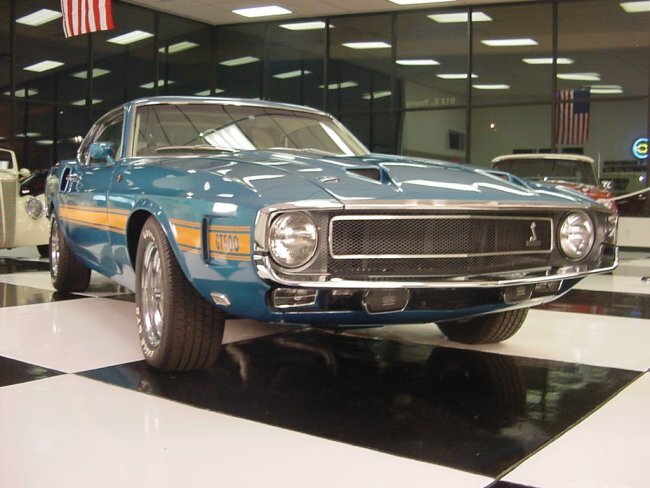 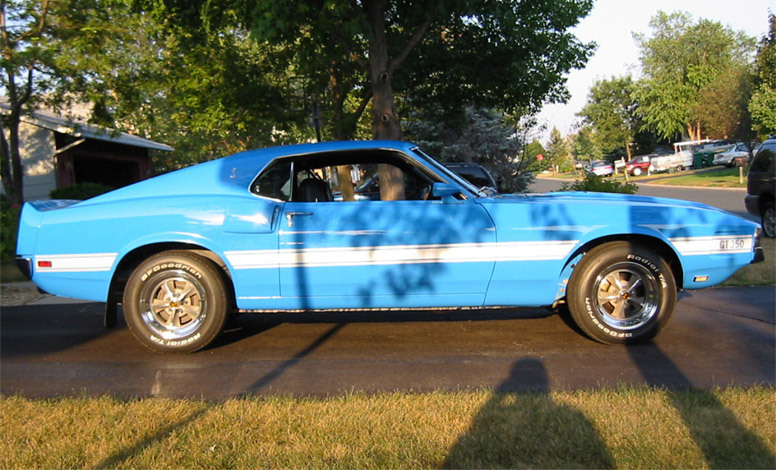 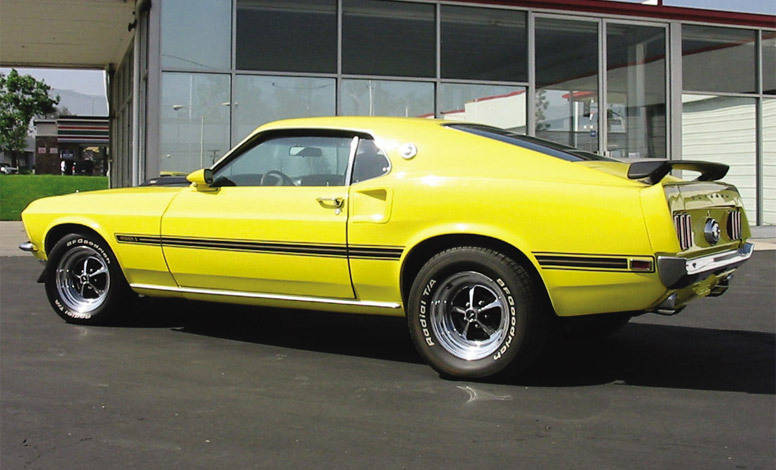 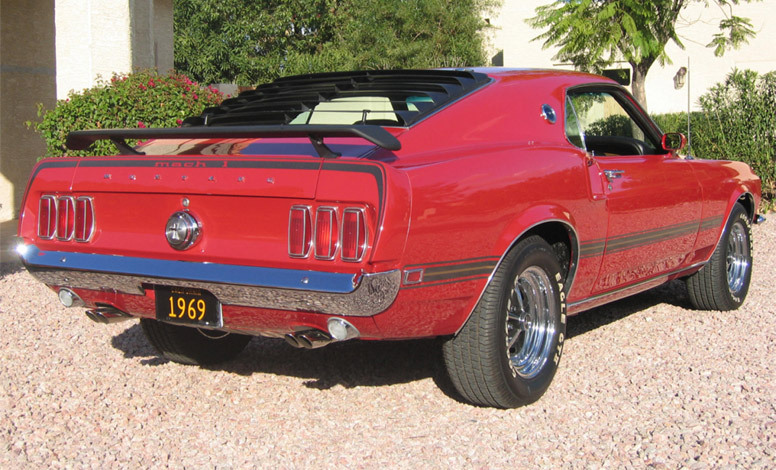 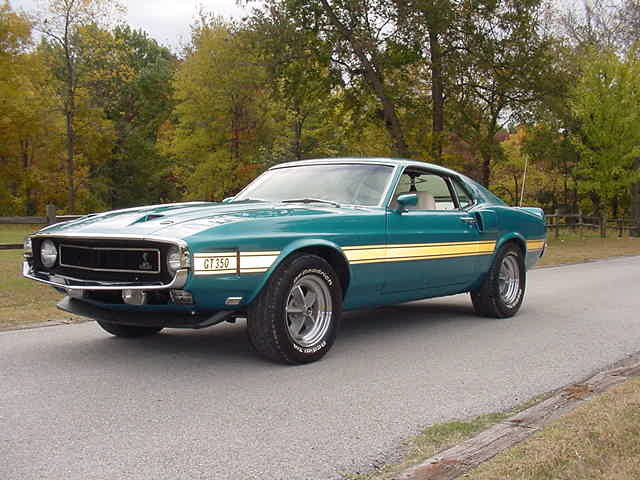 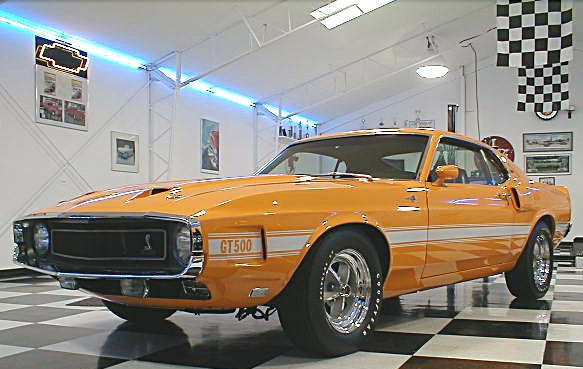 The Mach 1 was essentially a fastback GT with different stripes and a more upscale interior. 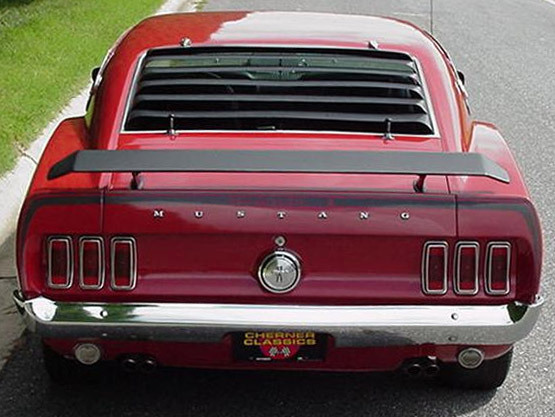 A spoiler and rear window louvers were optional. 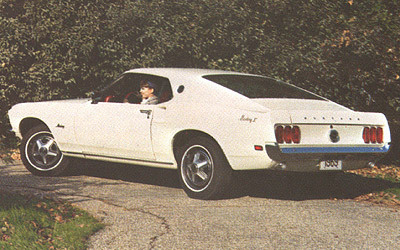 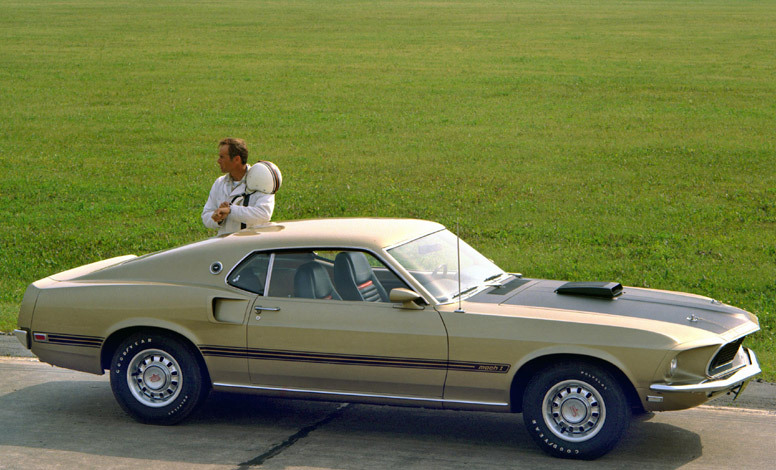 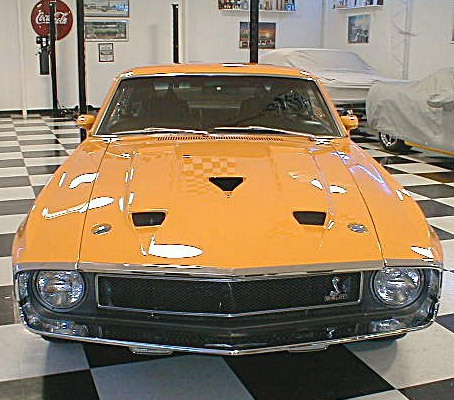 The Mach 1 included the GT's non-functional hood scoop. 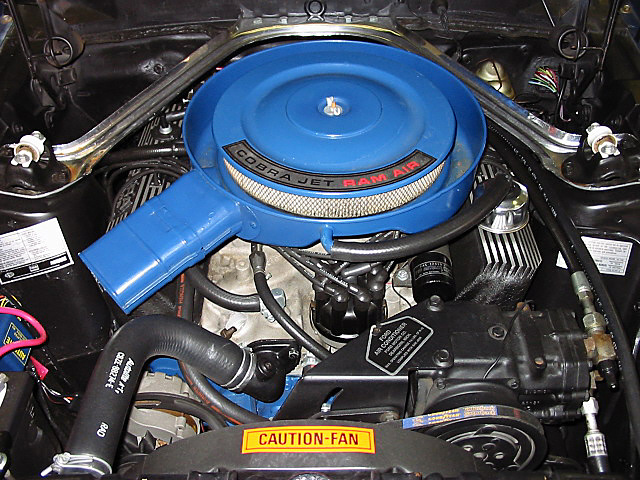 A functional "Shaker" scoop was available. 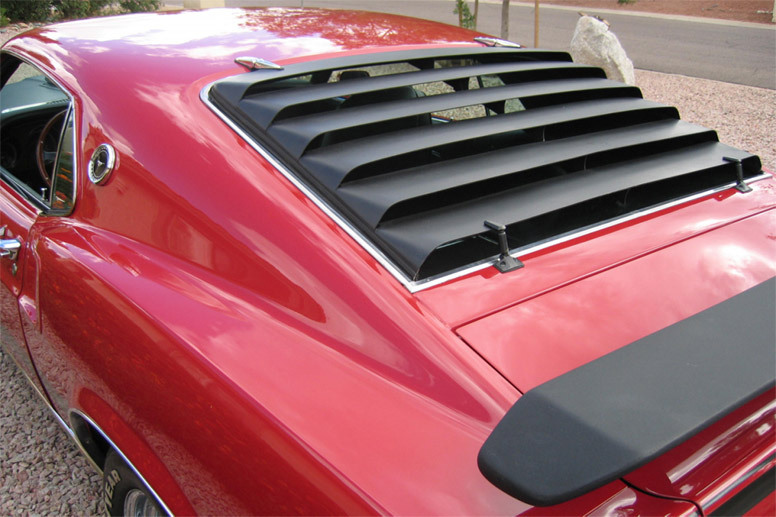 It was mounted on top of a special air cleaner and protruded though the hood. 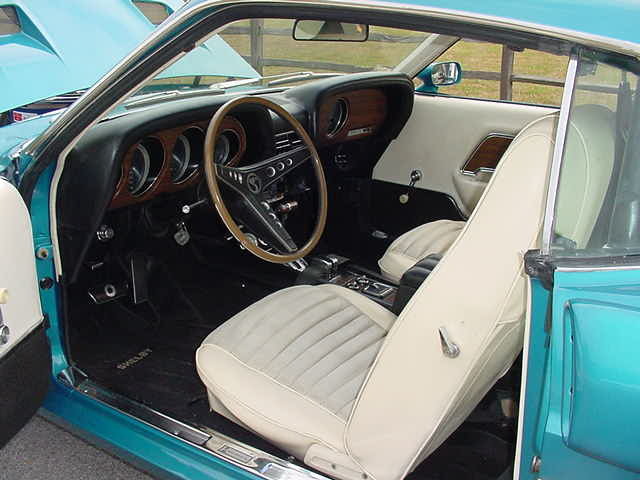 A vacuum-operated door opened when the throttle was floored, allowing cool air into the carburetor. 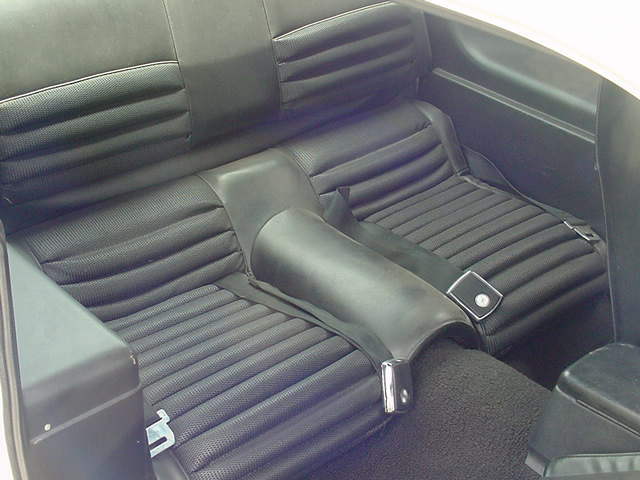 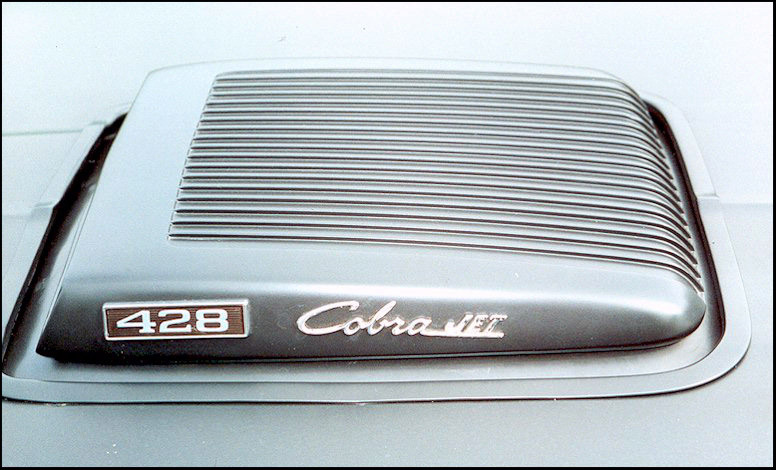 The scoop was standard on the 428 Cobra Jet Ram-Air V-8 and optional for Mach 1 or GT with 351 or 390 engines. 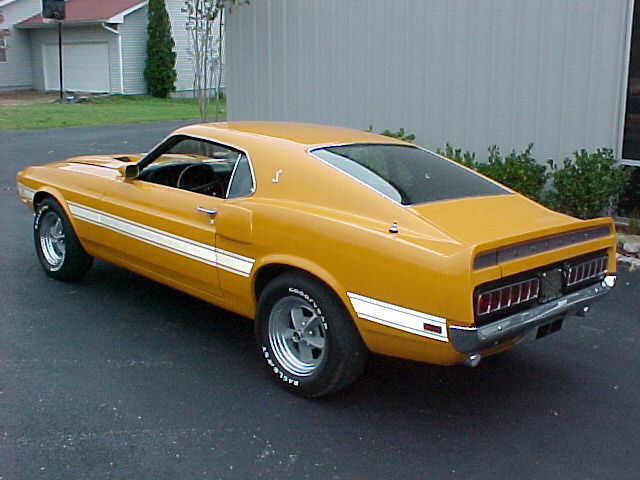 The stripe package was reflective. 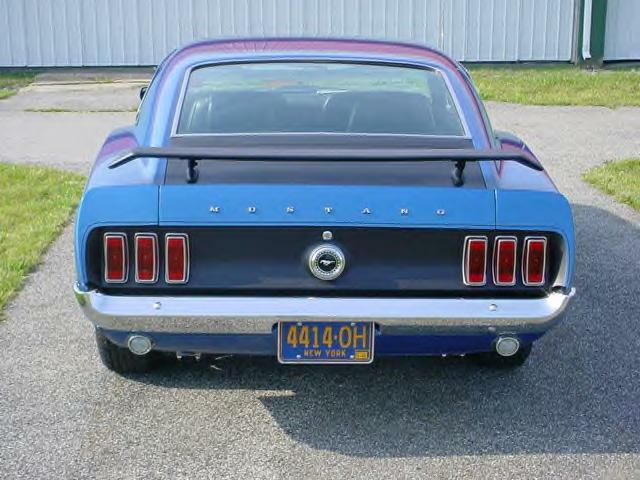 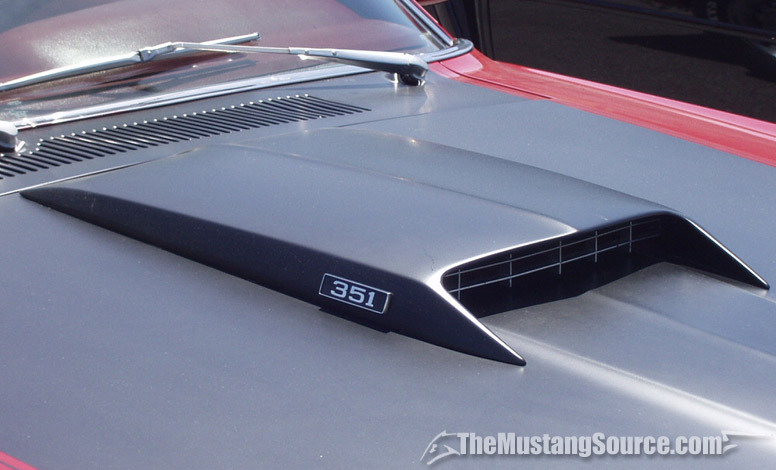 A flat black rear spoiler was not an option early, but became available late in the model year. 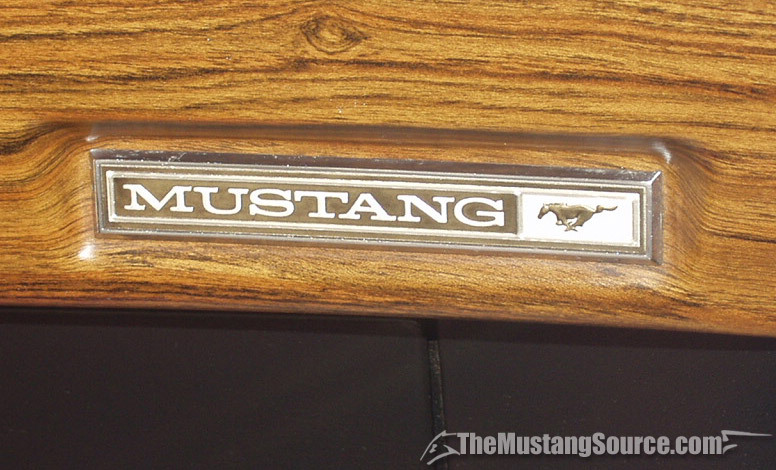 Grand� Mustangs were meant for the luxury-minded buyer. 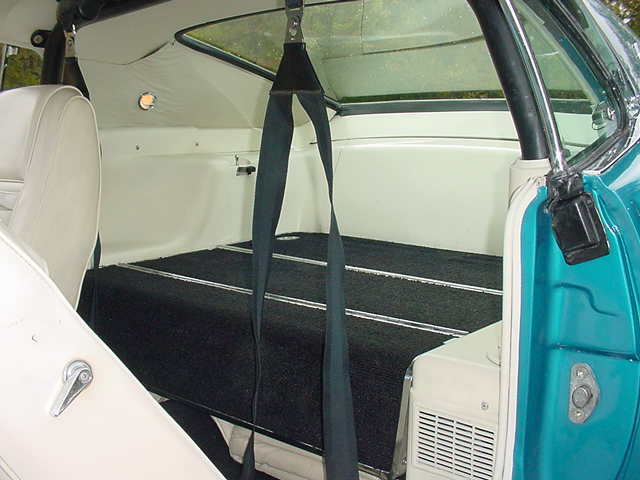 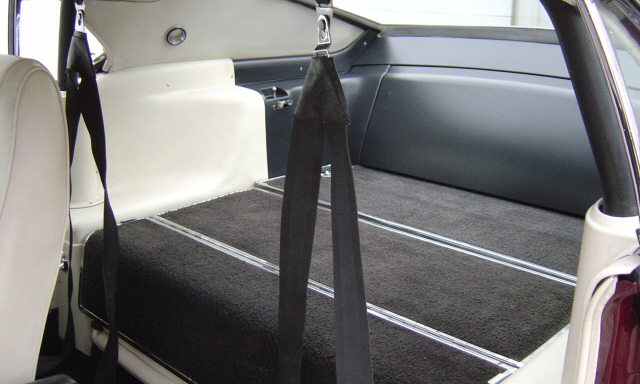 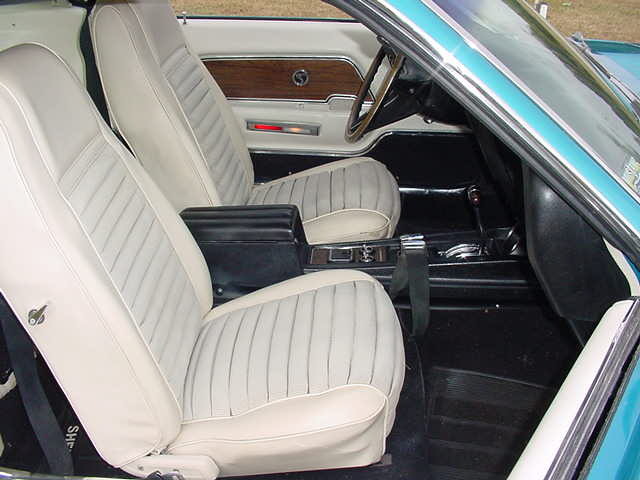 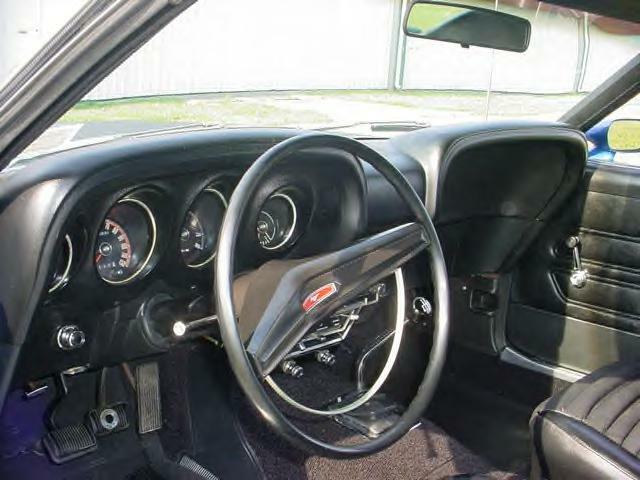 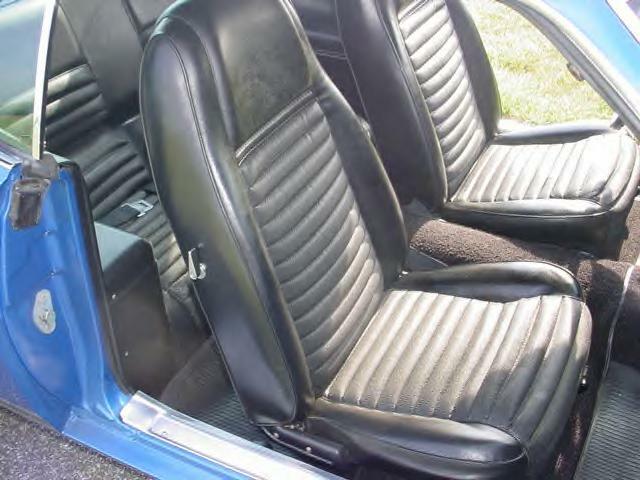 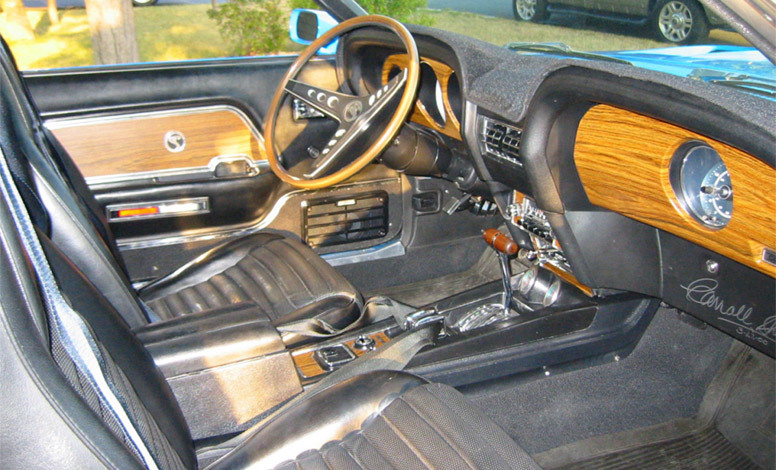 Coupes only, they came with Comfort Weave seats, woodgrain dash, padded interior side panels, and thick carpeting. 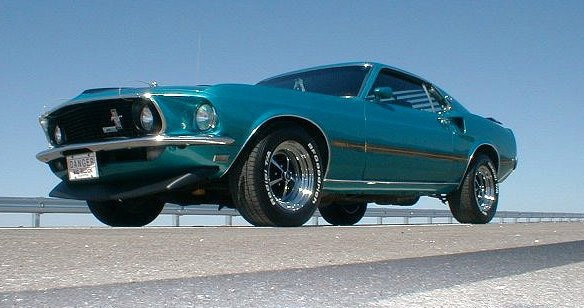 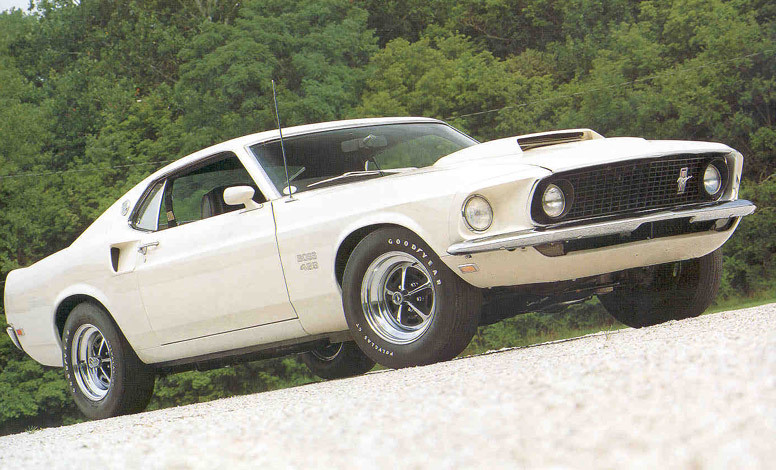 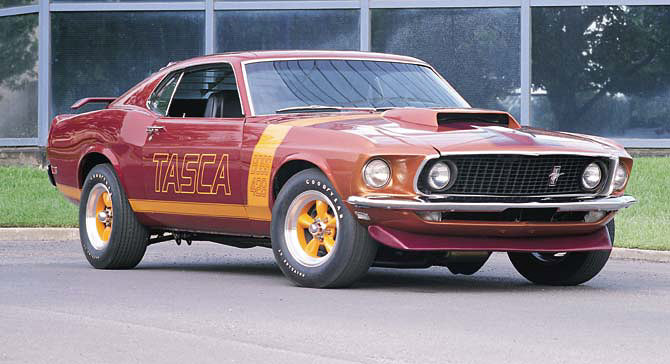 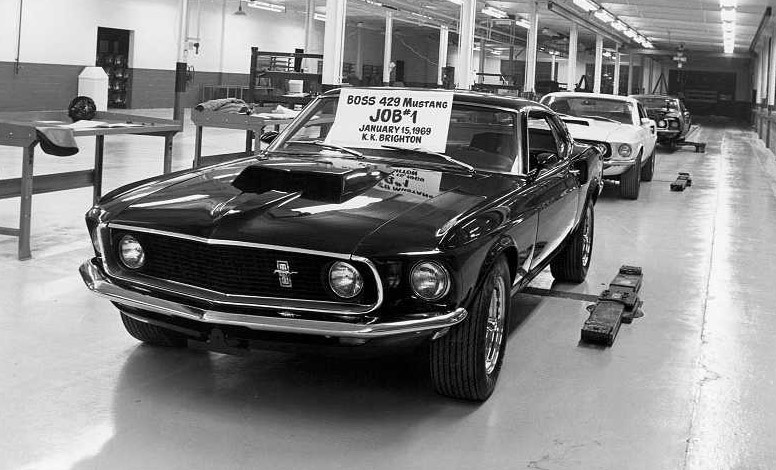 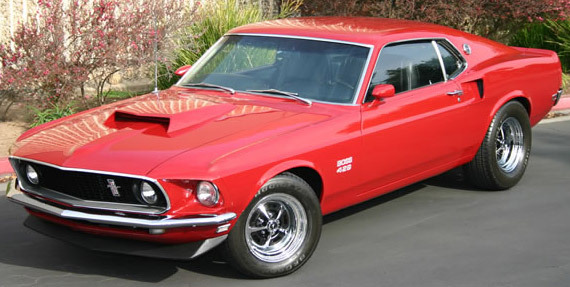 On the heels of the 302 would come what is still considered the biggest, baddest, and meanest of all Mustangs: the Boss 429. 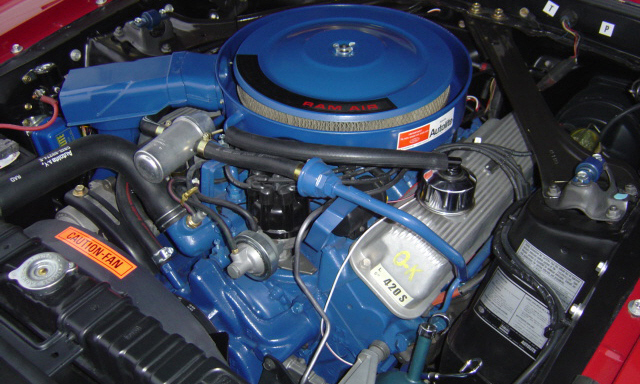 Featuring the stock NASCAR version 429 engine, the cars were actually built by Kar-Kraft at the KK-Brighton assembly plant, located in Brighton, Michigan. 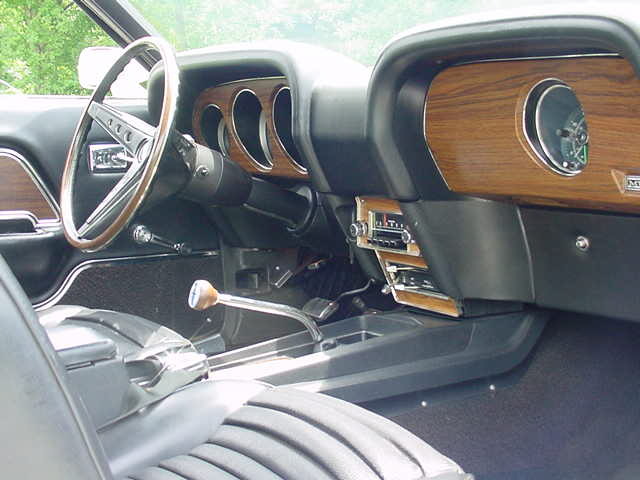 Each vehicle was hand assembled. 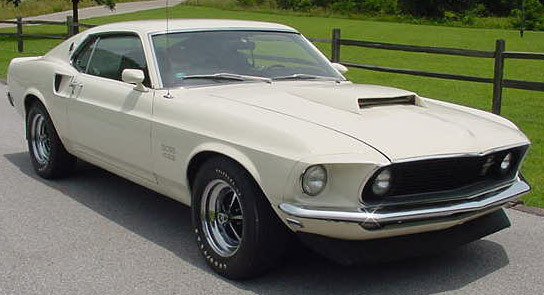 1969 production ran from January 1969 through July 1969. 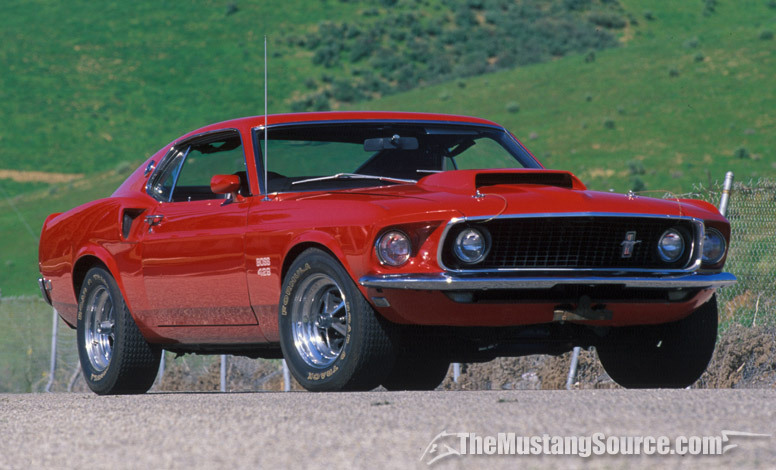 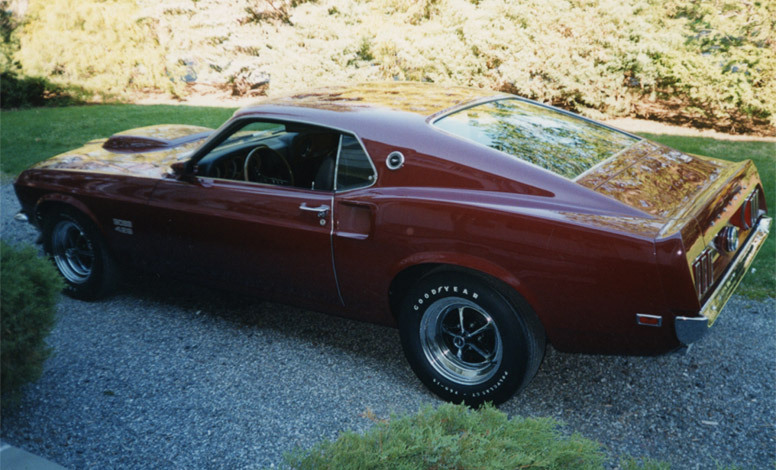 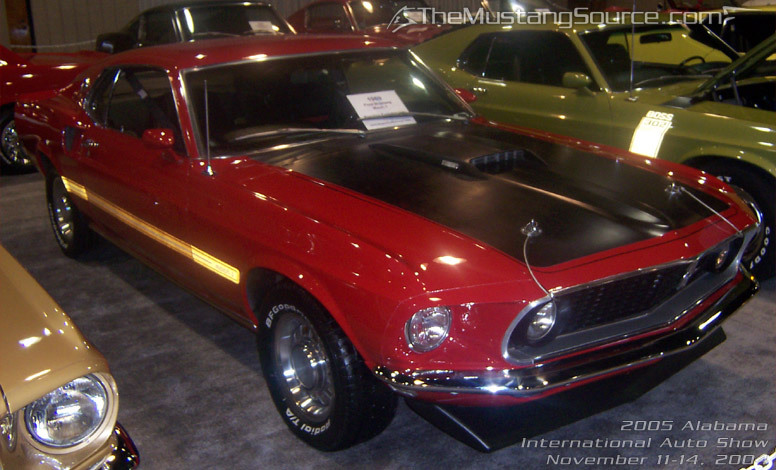 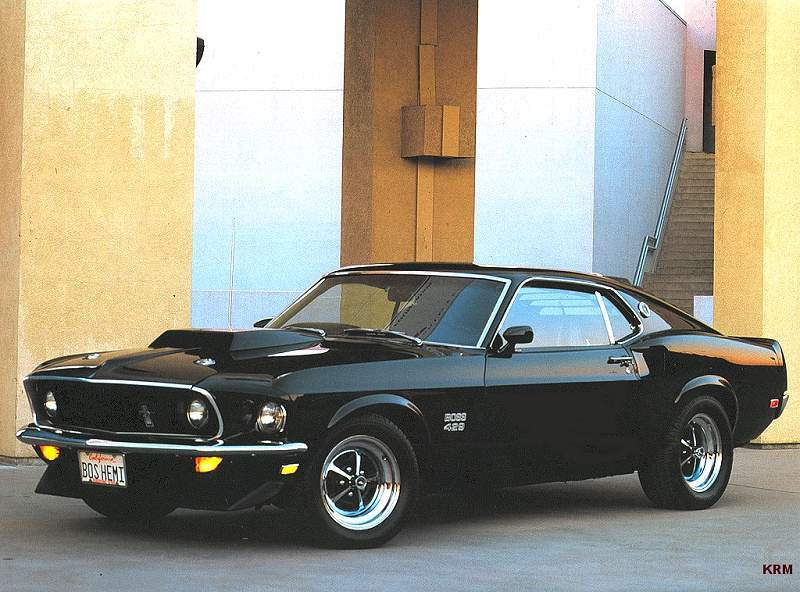 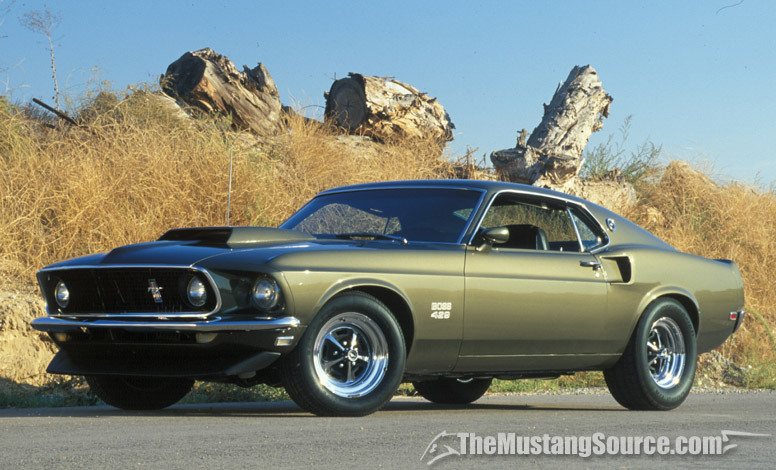 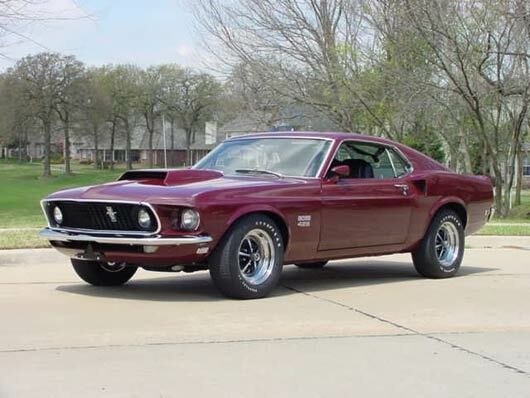 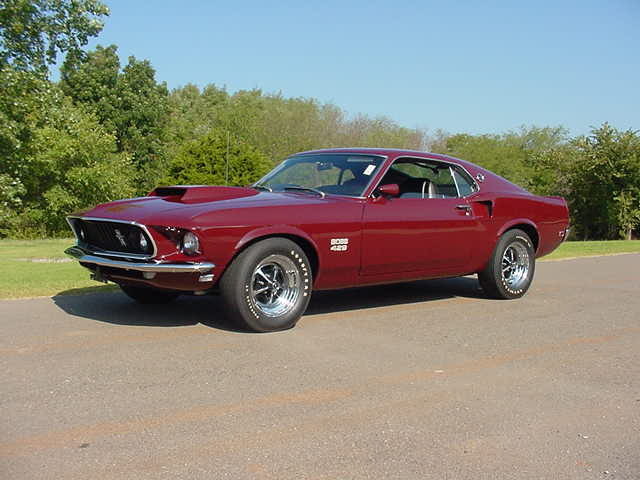 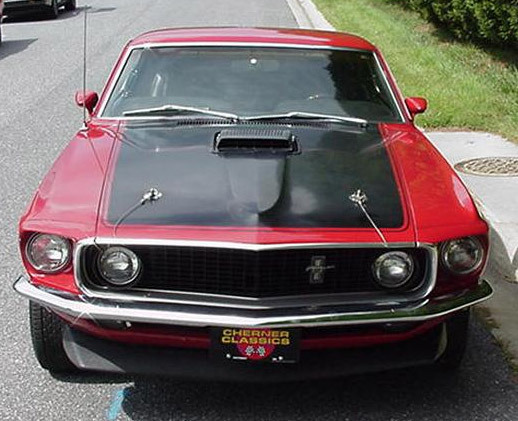 1969 Boss 429 Mustangs were available in Raven Black, Royal Maroon, Black Jade, Candyapple Red, and Wimbledon White. 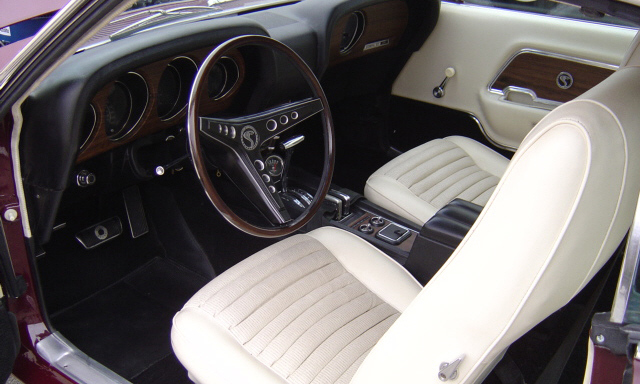 All interiors were black. 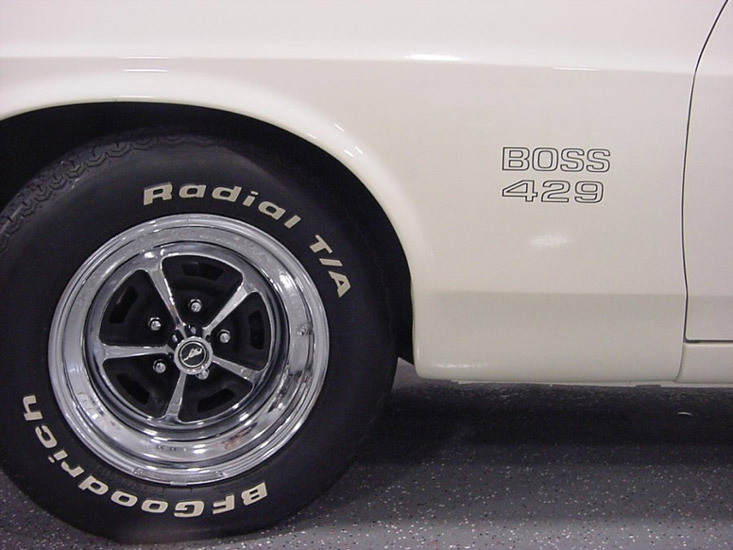 For more information on Boss '9s, visit BossPerformance.com. 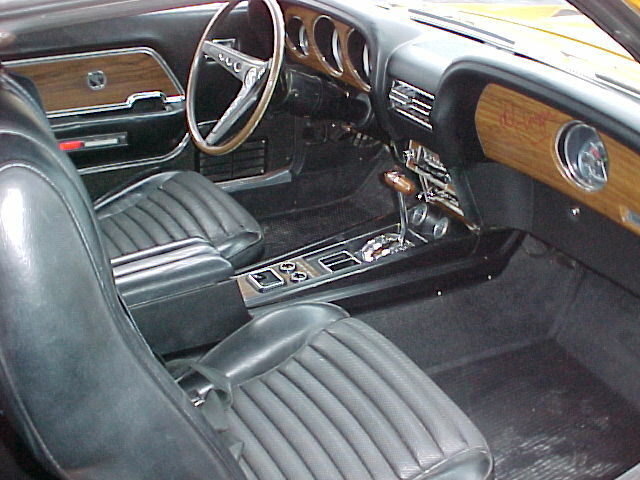 The Limited Edition 600 was a promotional unit developed by the Philadelphia sales district in May of 1969. 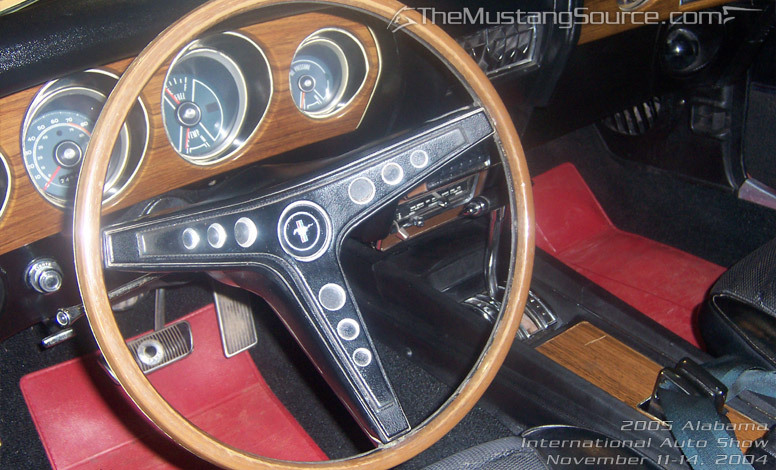 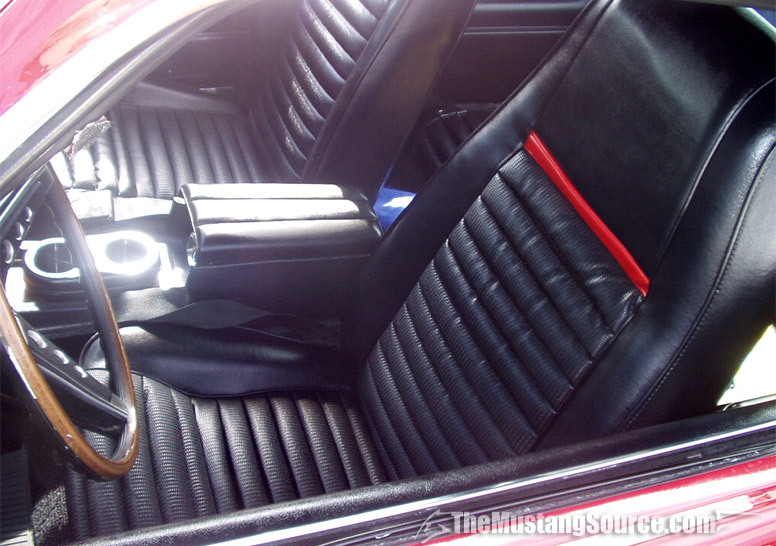 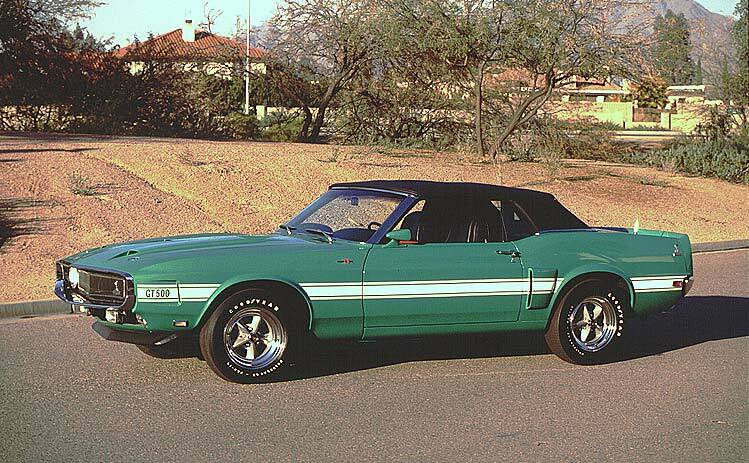 The 600 consisted of special order, custom colored Mustangs in either "Flower Power Red" or "Groovy Green." 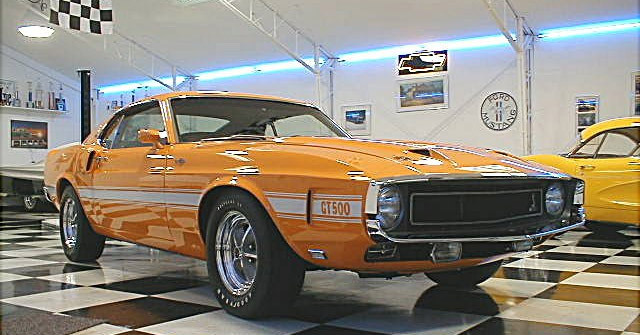 This promotion was only available on hardtops or sportsroofs and included a hood scoop, remote, chrome mirror, AM radio, full wheel covers, whitewalls, tape stripes, and unique fender emblems, all for a special price. 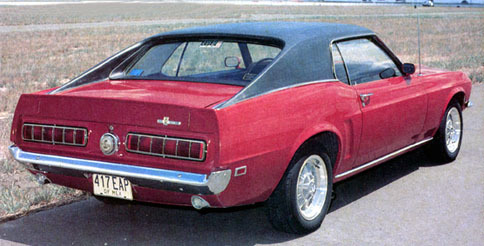 Even some hardtops were delivered with vinyl roofs. 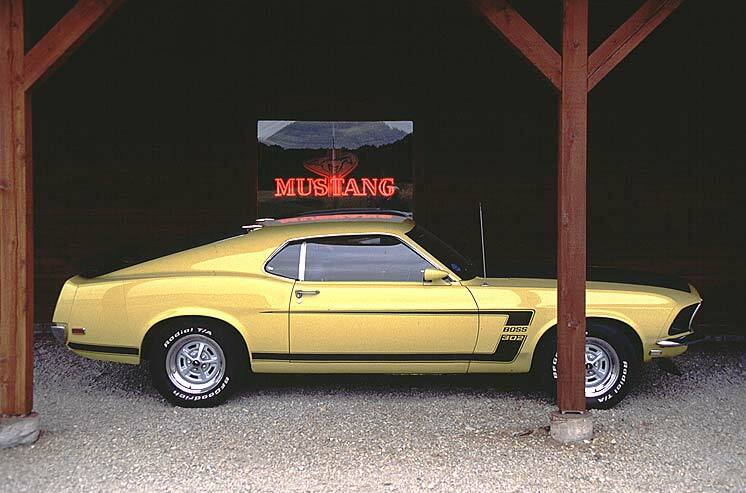 The promotion's sales goal was to sell 600 of these special units, however, only 503 of Limited Edition 600s were produced, clearly falling short of the target of 600 Mustangs. 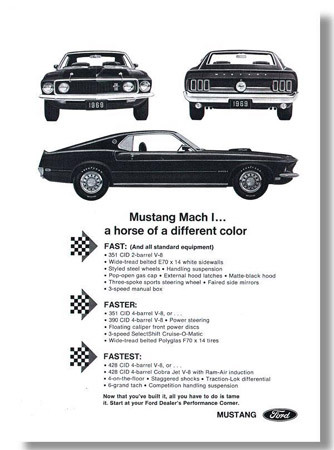 Interestingly, there was least one Mach 1 in this promotion. 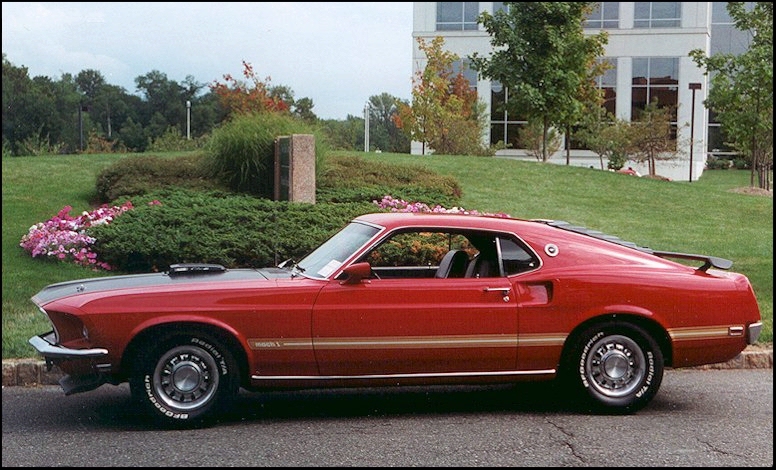 All cars in this promotion were built in batches on April 21st and 22nd, and many were delivered to Morgan Ford (now Medford Ford) in Medford NJ, for prepare and affix the fender badges. The Limited Edition 600 Mustangs were then promoted throughout the Philadelphia District by the means of specially created newspaper ads. 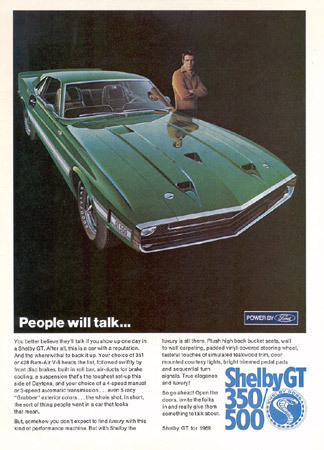 These ads called attention to the custom colors and limited availability. 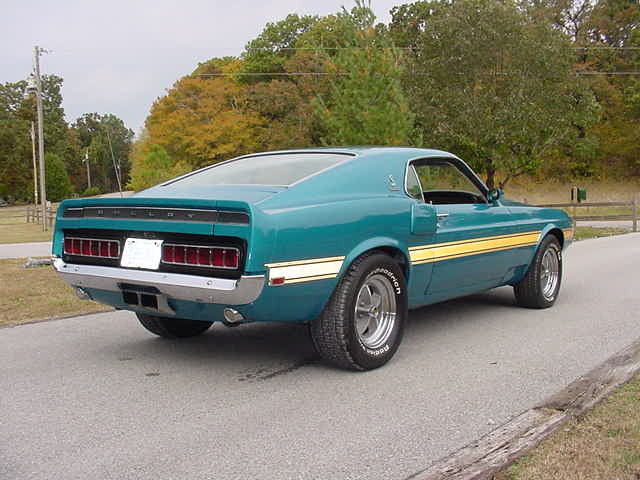 About 15-20% were of the green variety. 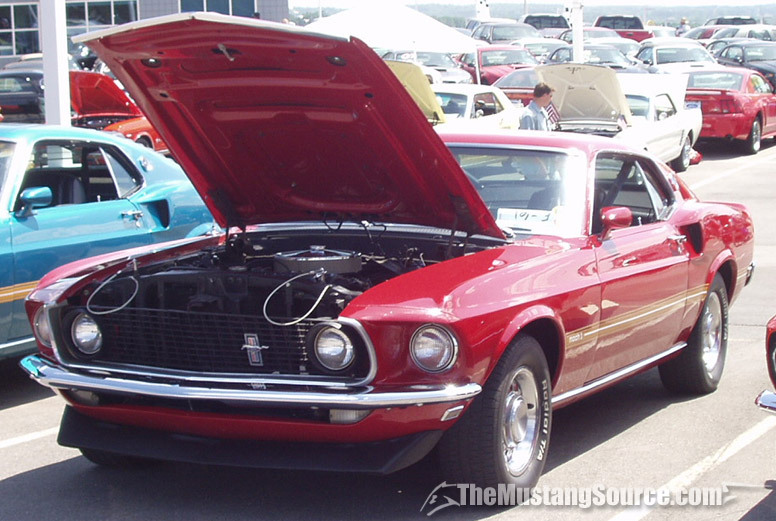 It is known that 87 red cars were ordered in off standard equipment order 2784. 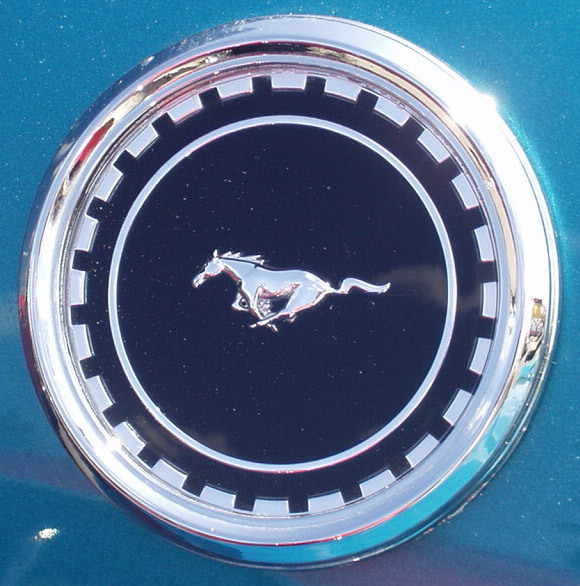 All 600s will be identified by the absence of a color code and a DSO of 16 plus 2783 through 2788 number on the door data plate. 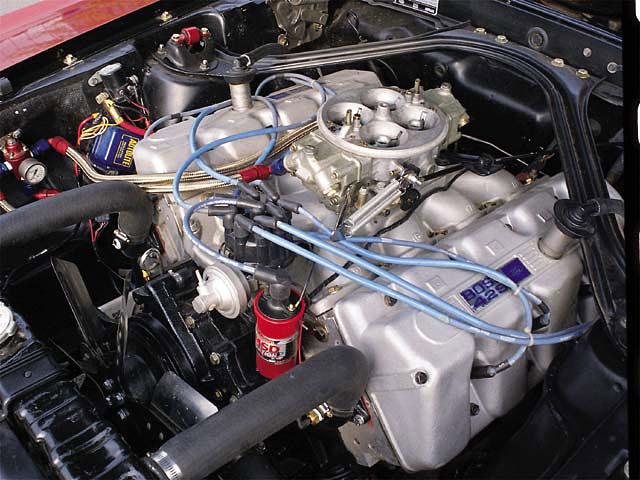 Most but not all 600s were powered by six cylinder engines, largest available engine was the 351-2v. 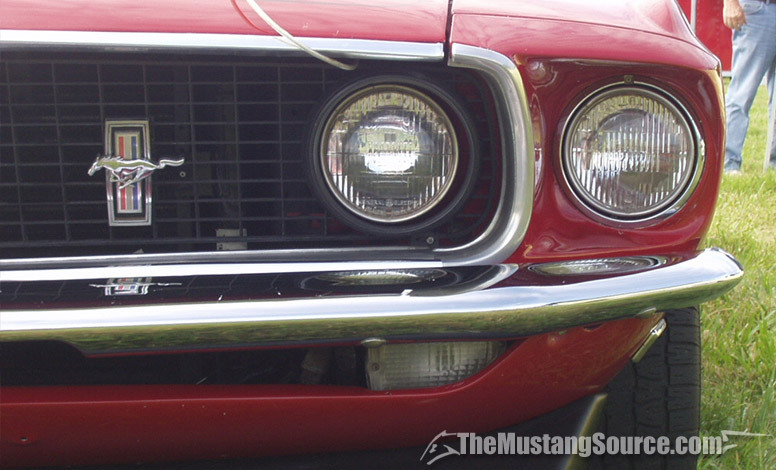 1969 Shelbys got a full-width grille with integrated scoops. 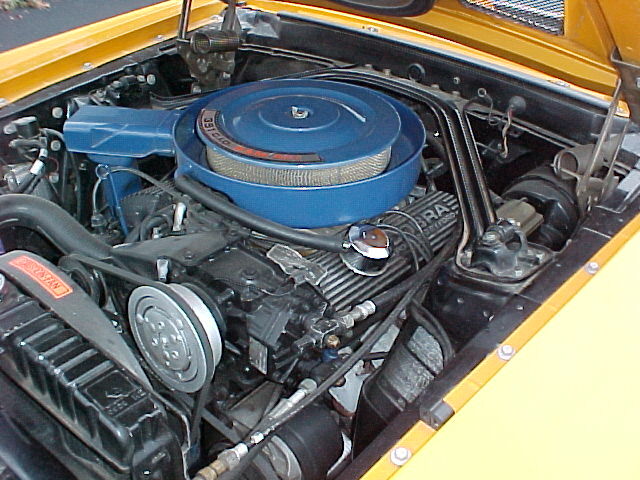 The hood had five small scoops; three forward-facing to force air into the engine and two rear-facing to extract heat. 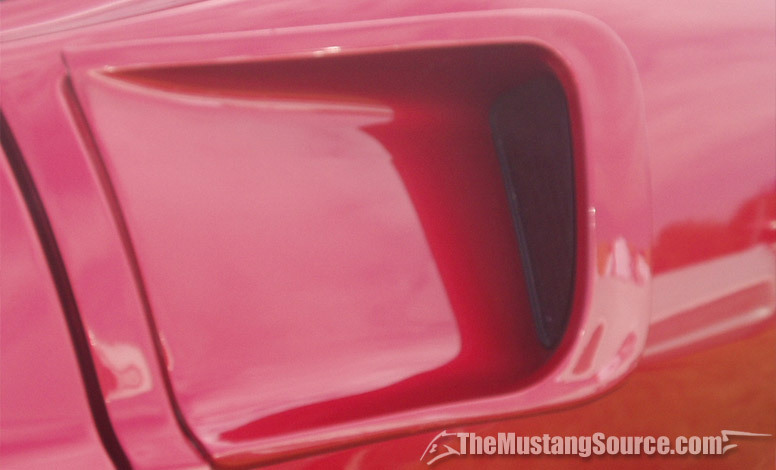 The functional side scoops helped cool the brakes. 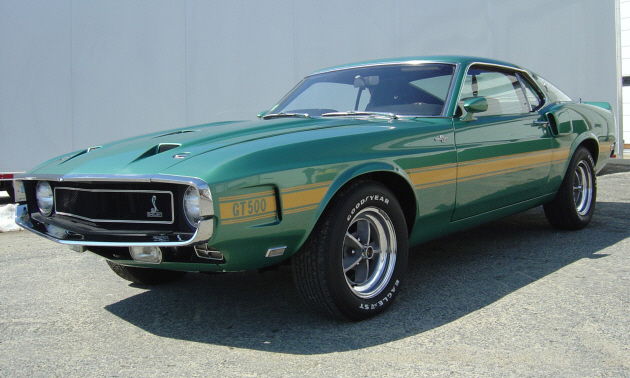 Shelby de Mexico produced 306 Shelby G.T. 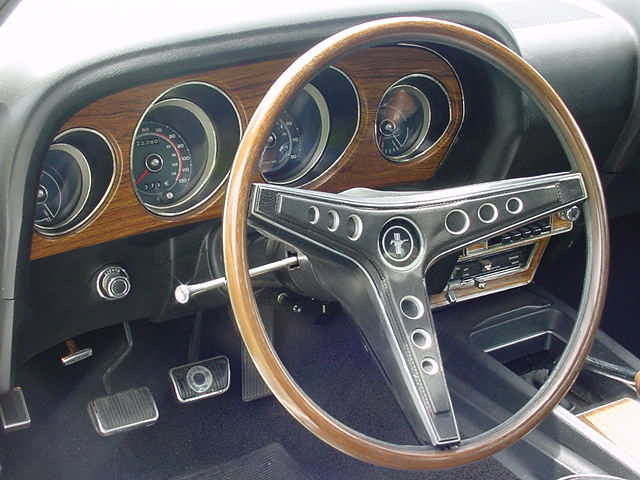 350s in 1969. 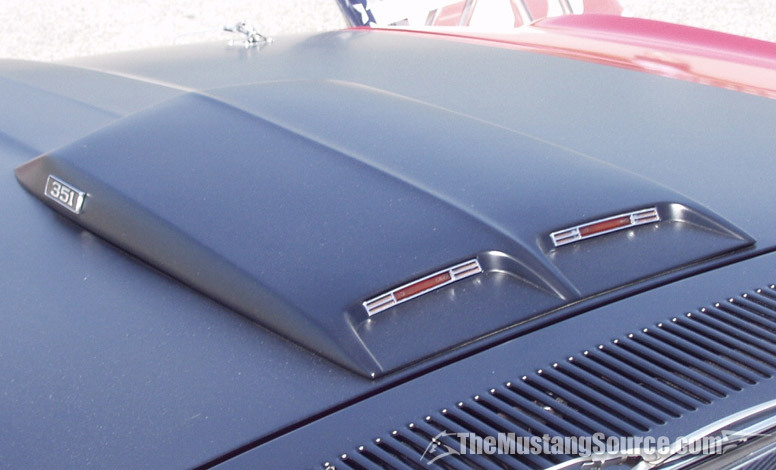 They were based on coupes with 302s, but got fiberglass roofline extensions to make them look like a sportsroof. 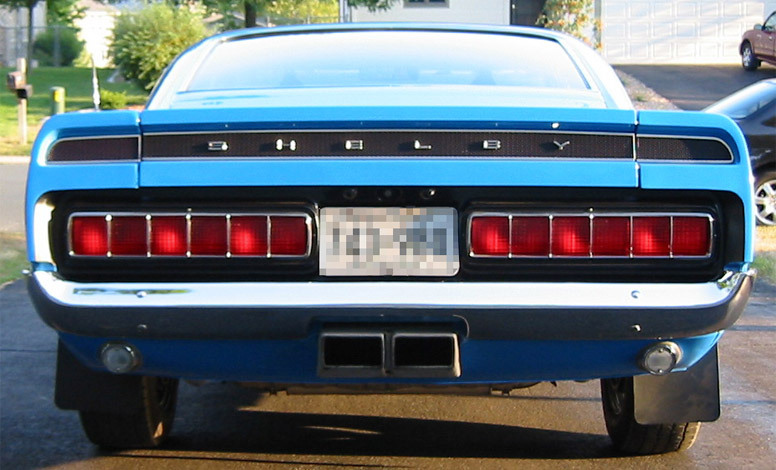 They also wore slightly bulged fiberglass hoods 1965 Thunderbird taillights.